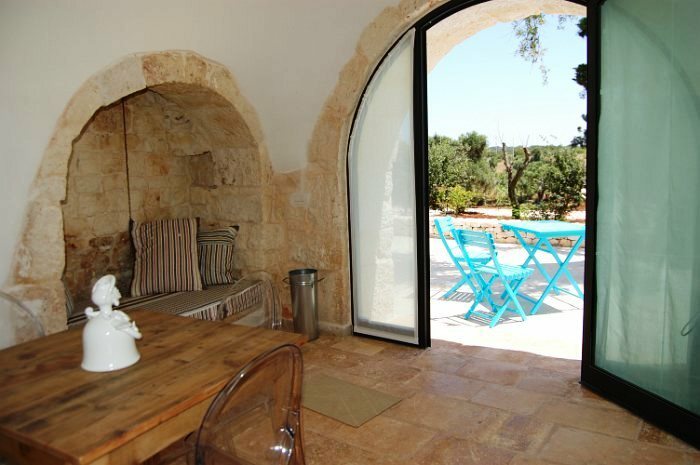 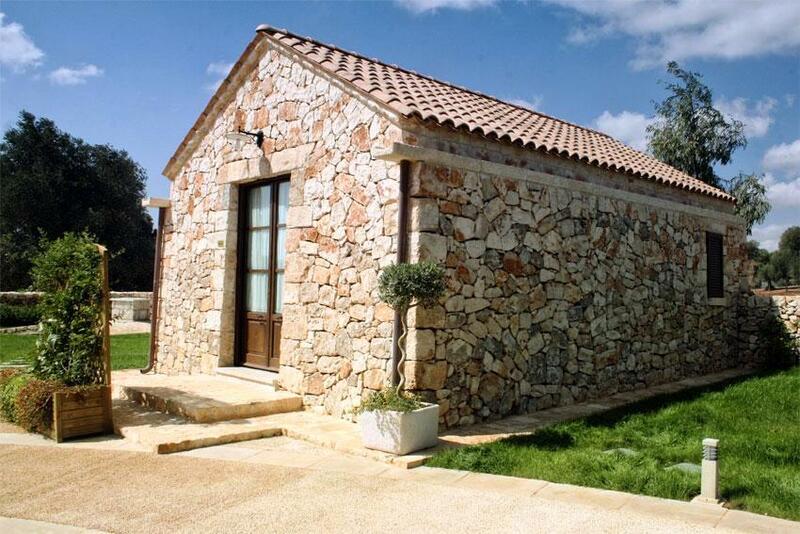 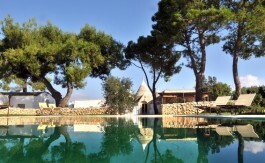 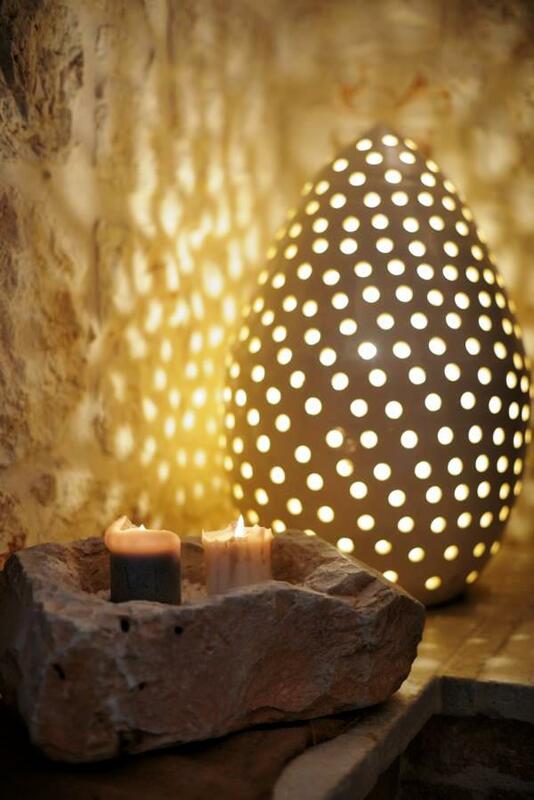 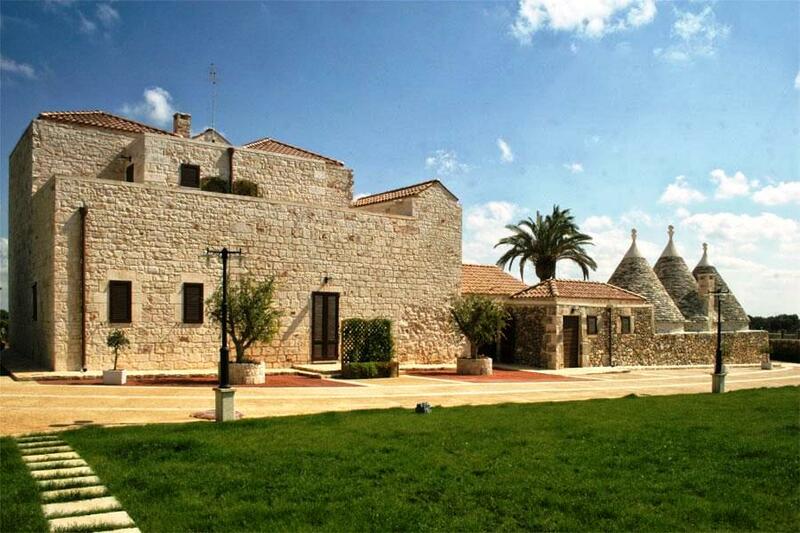 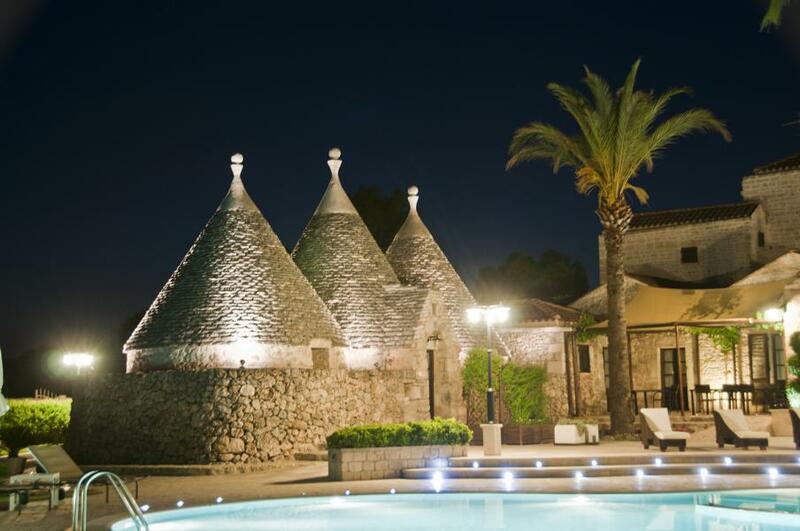 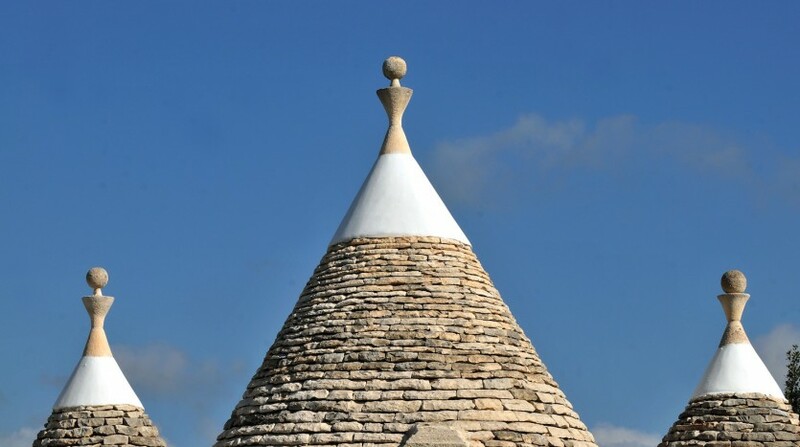 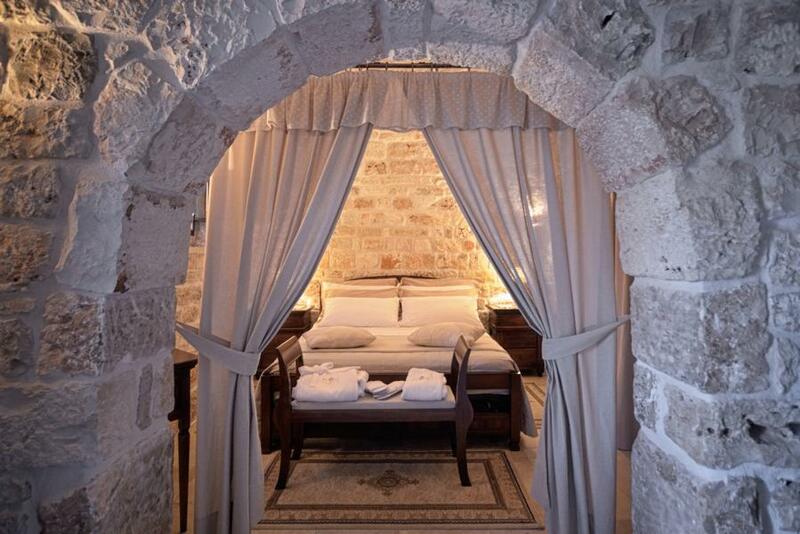 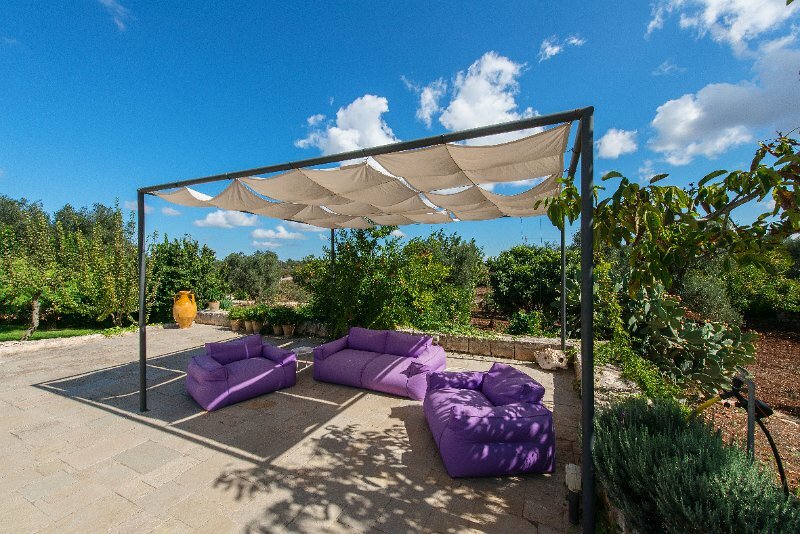 A 5-suite trullo close to the town of Ceglie Messapica. 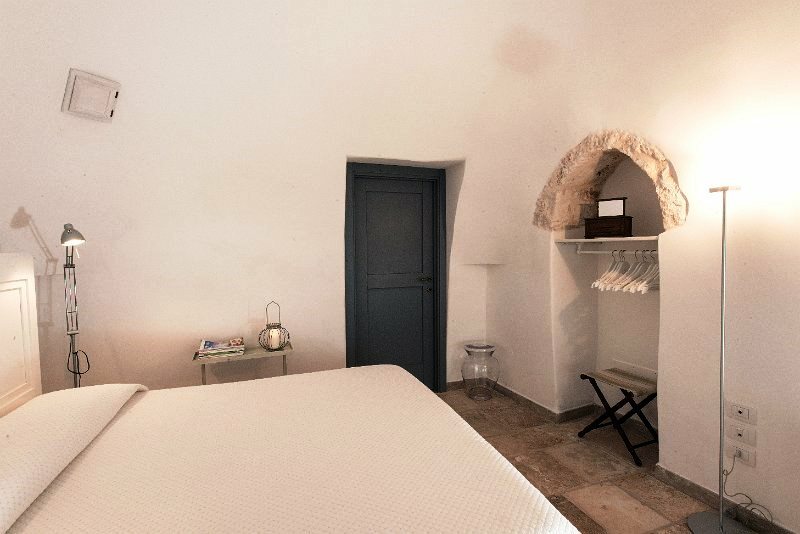 This is a typical Pugliese house recently restored for those who want to enjoy a wonderful holiday between the past and present of Puglia. 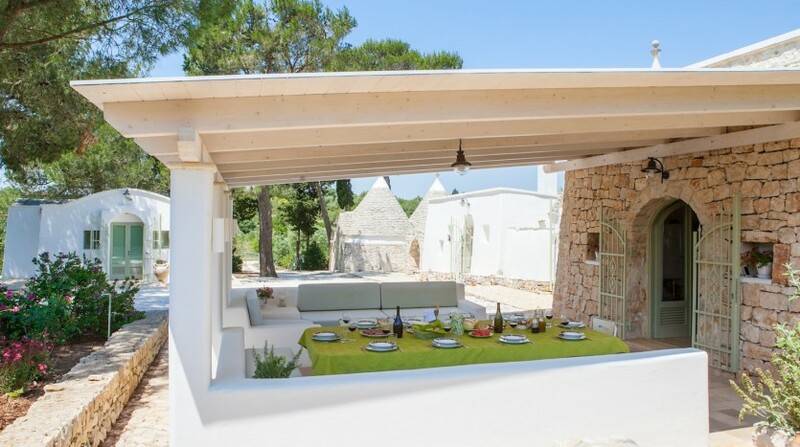 Villa Messapica, is a wonderful ground floor Trullo containing five separate private suites which are accessed from outside the villa. 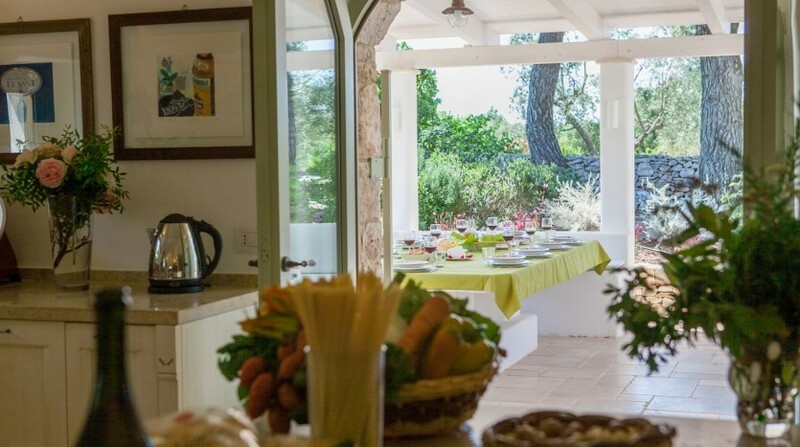 There is a spacious open plan kitchen and dining area for the guests to dine and socialise. 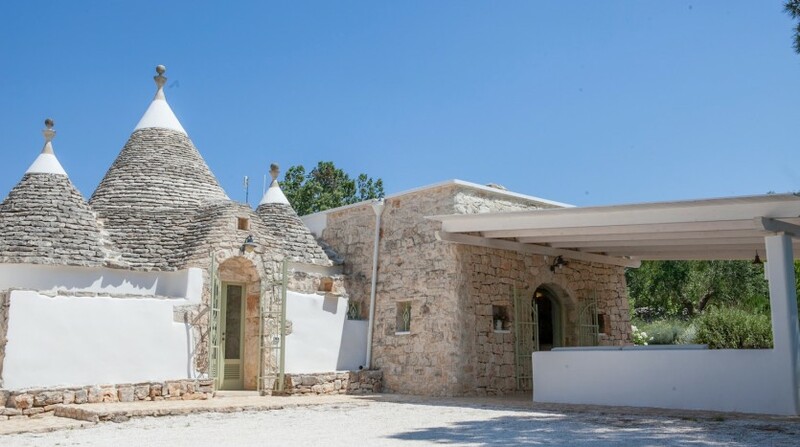 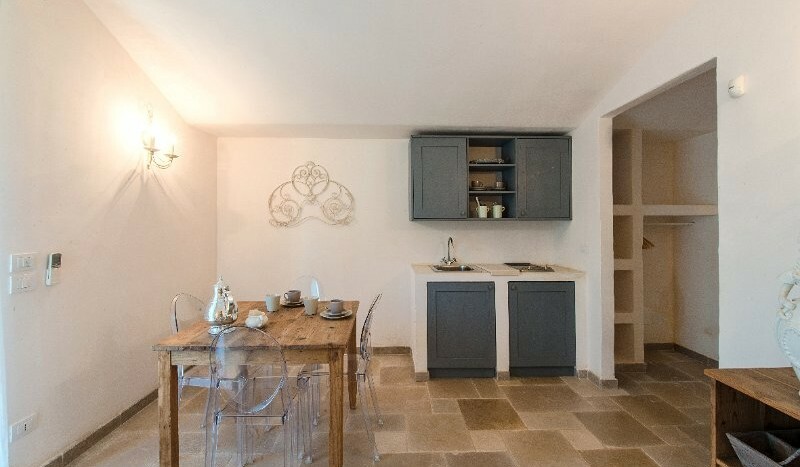 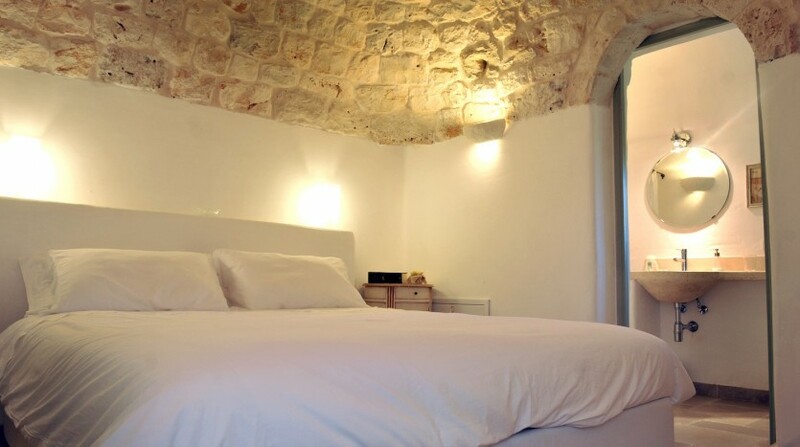 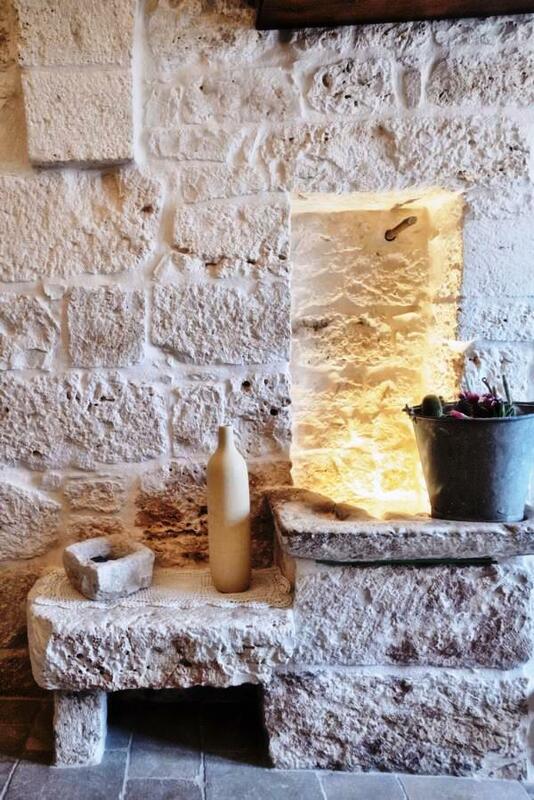 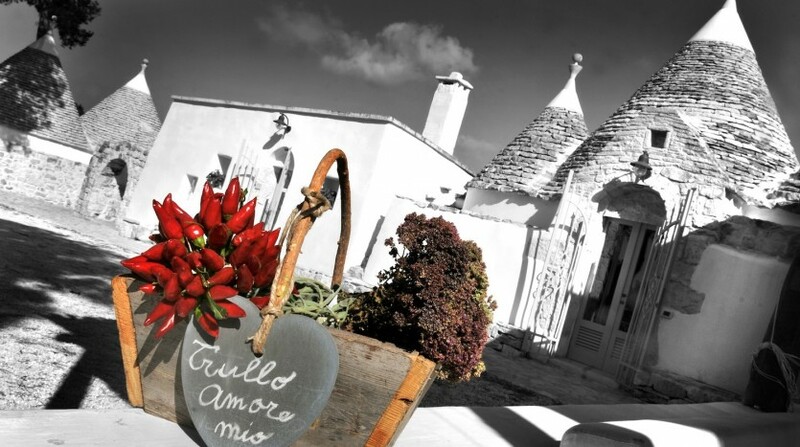 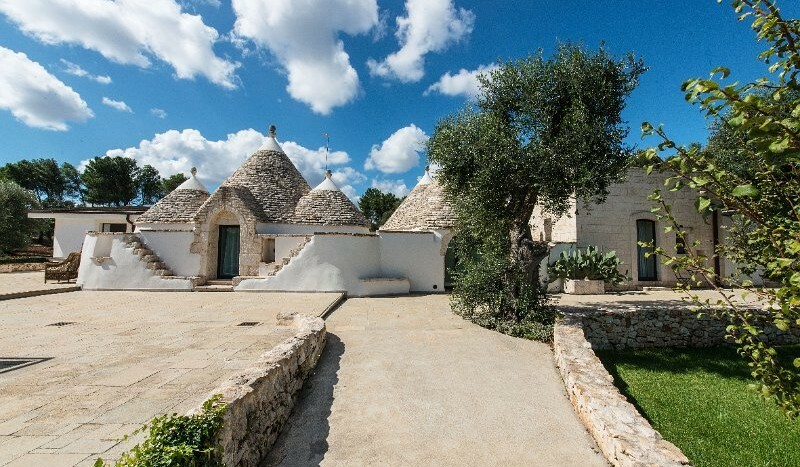 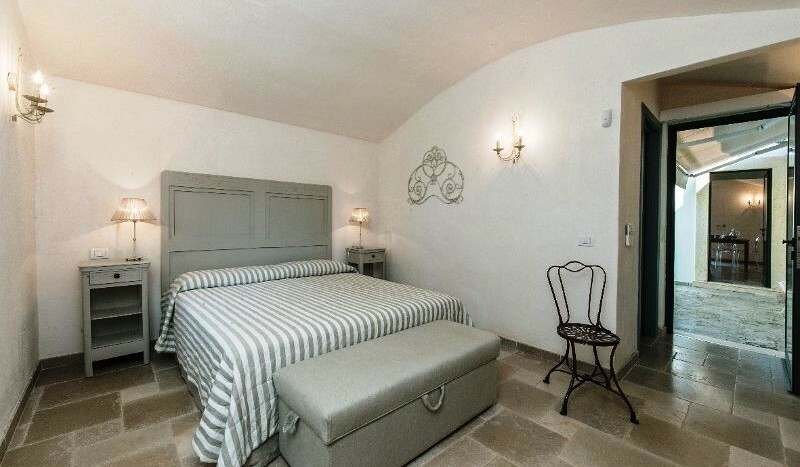 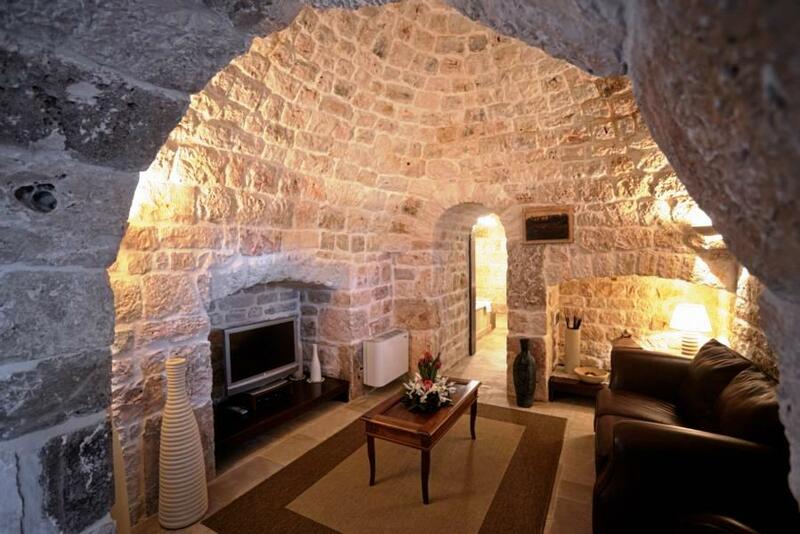 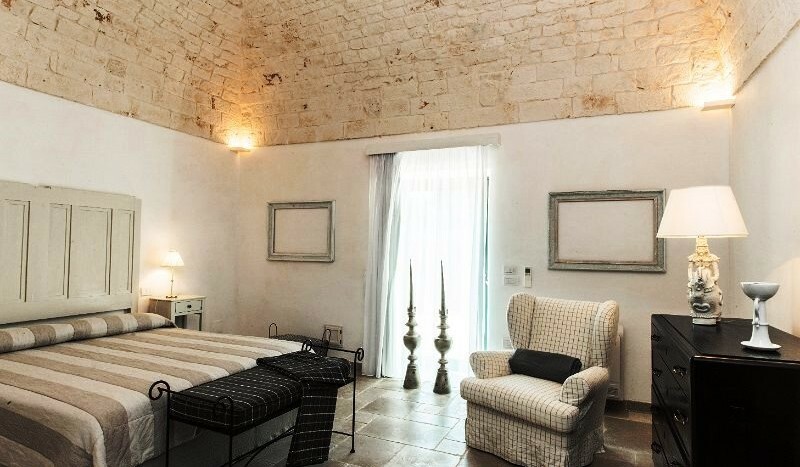 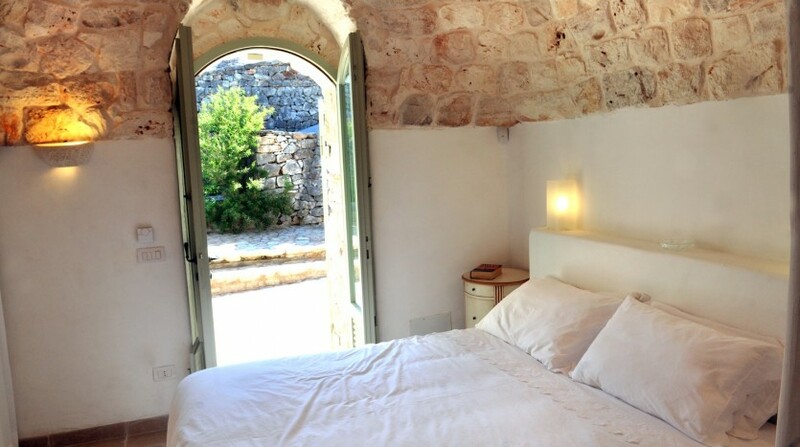 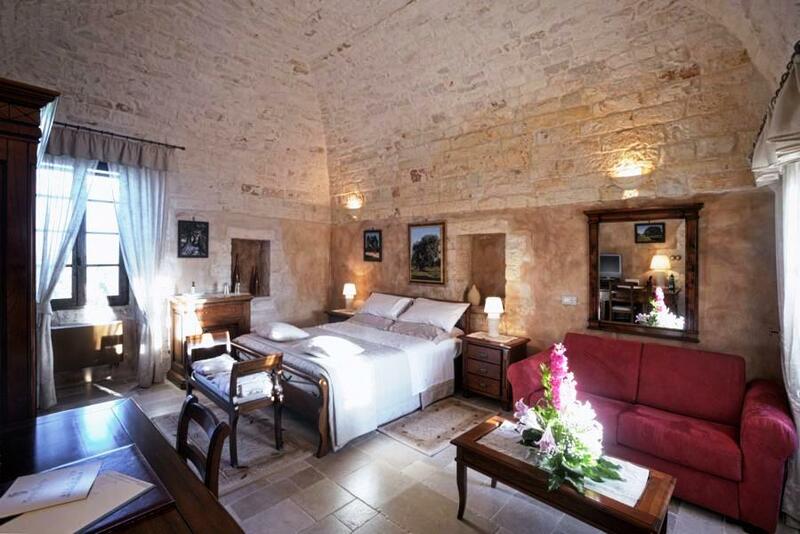 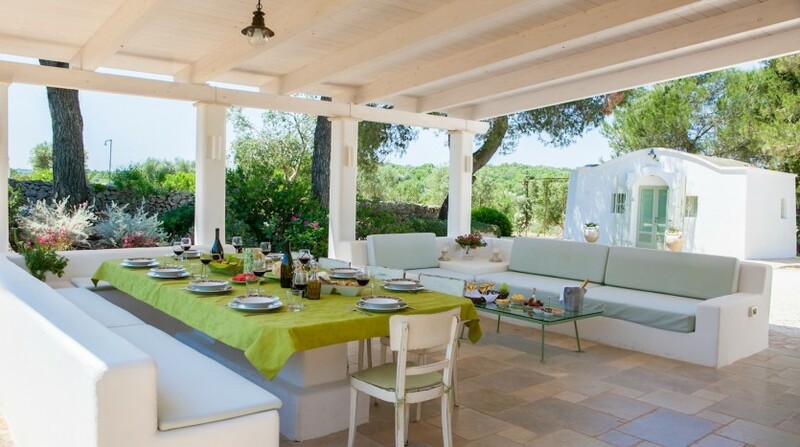 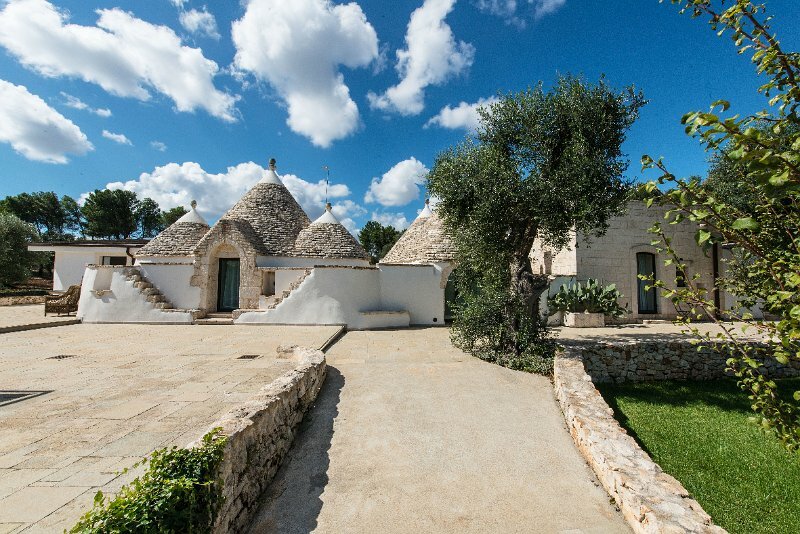 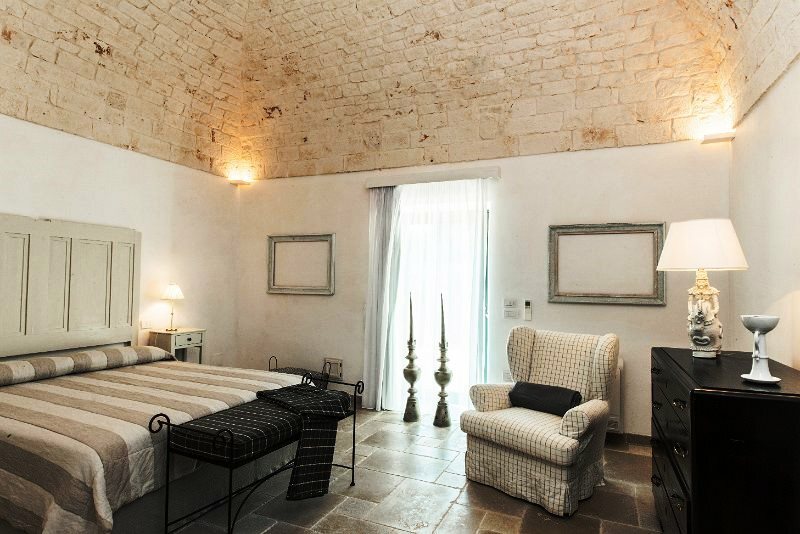 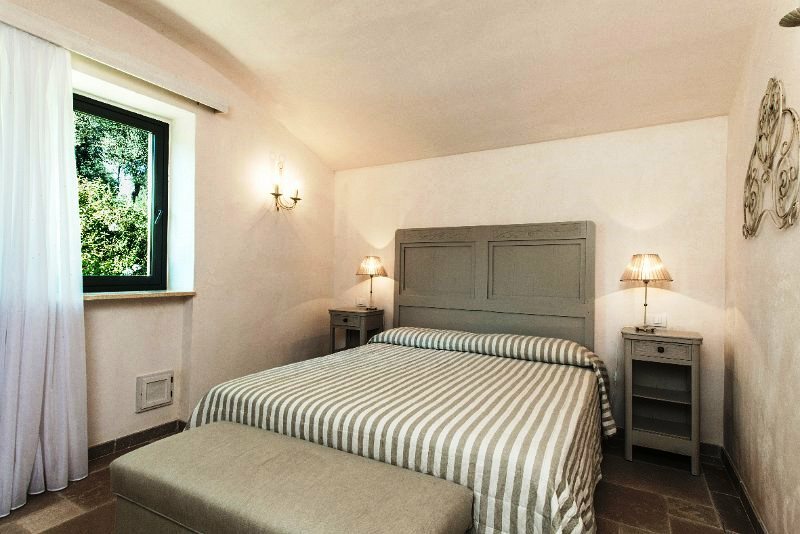 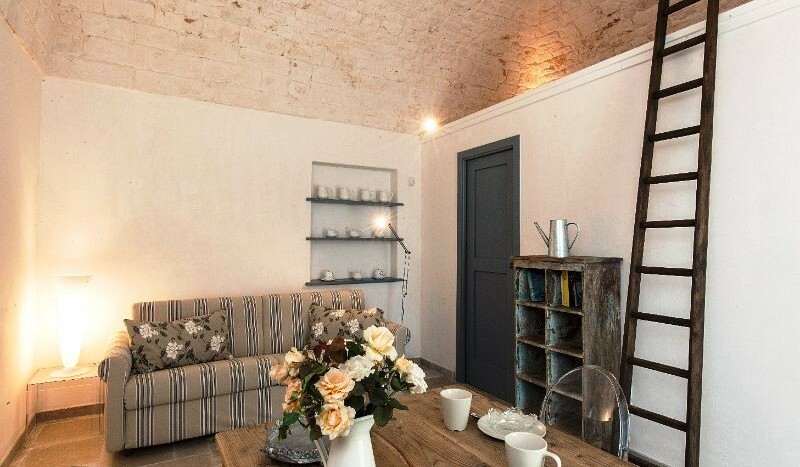 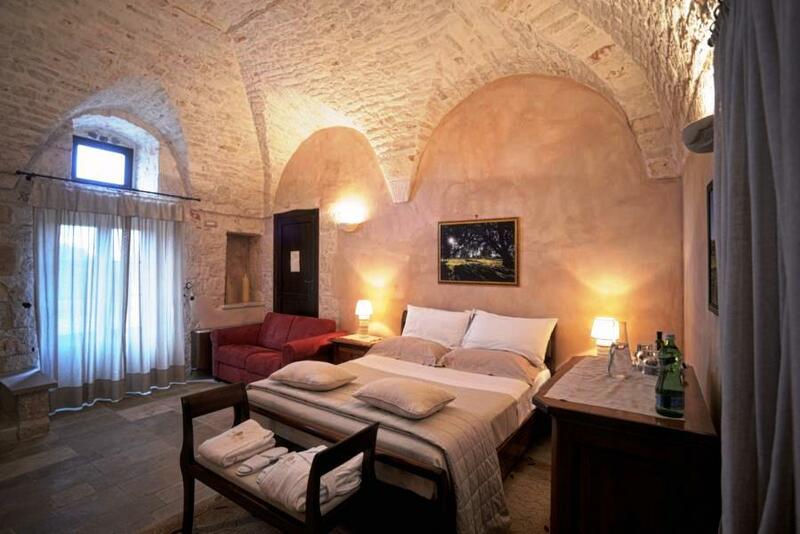 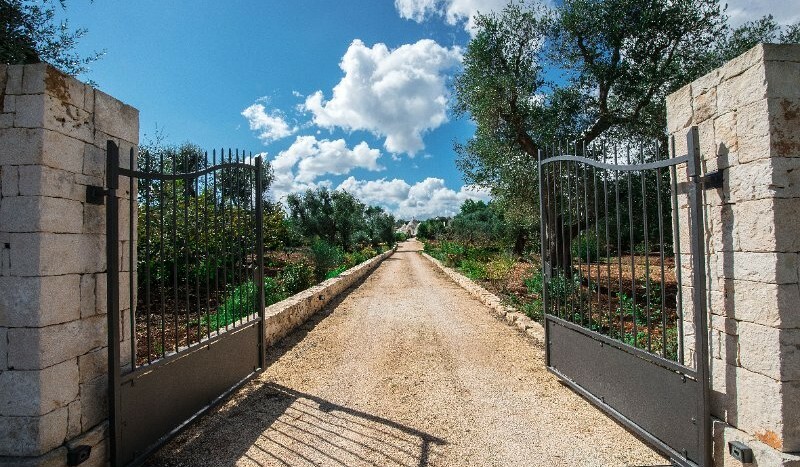 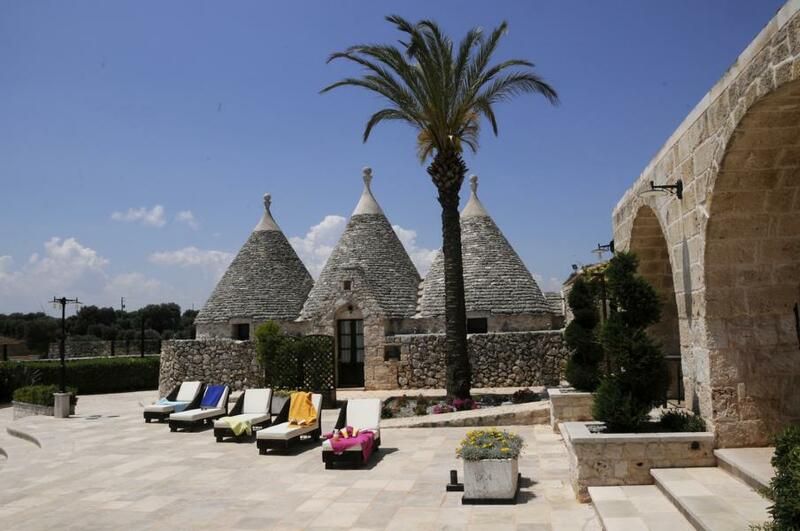 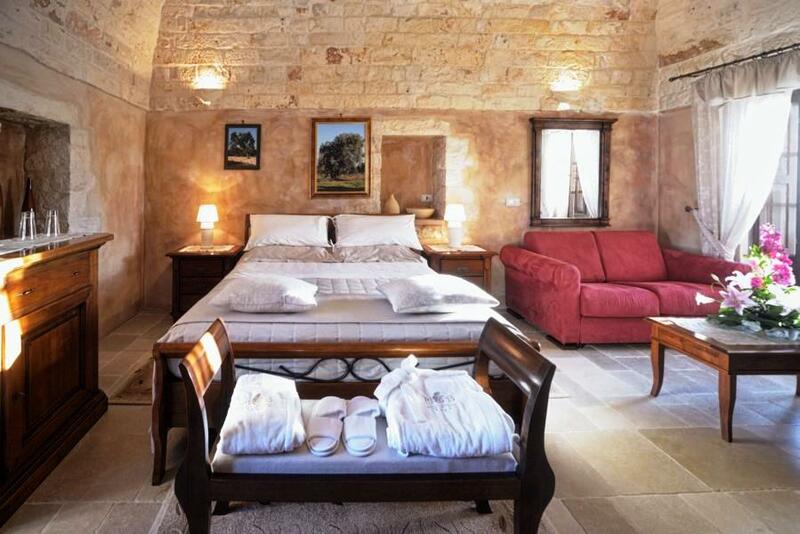 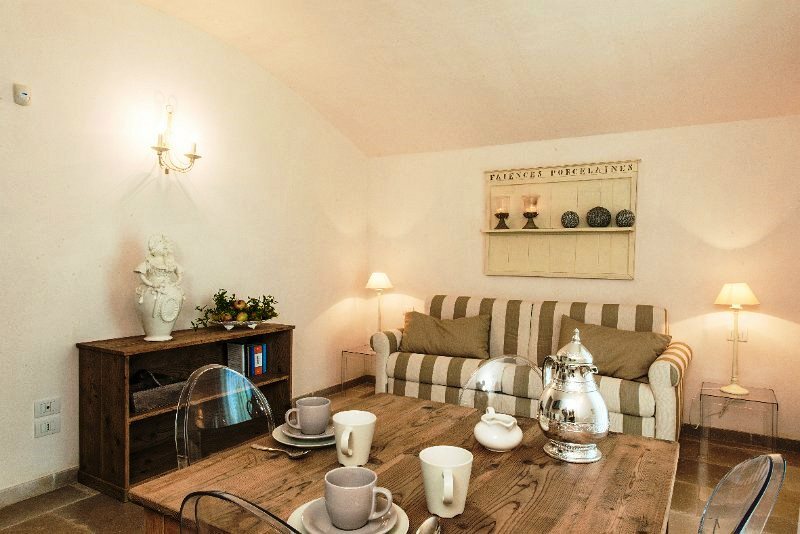 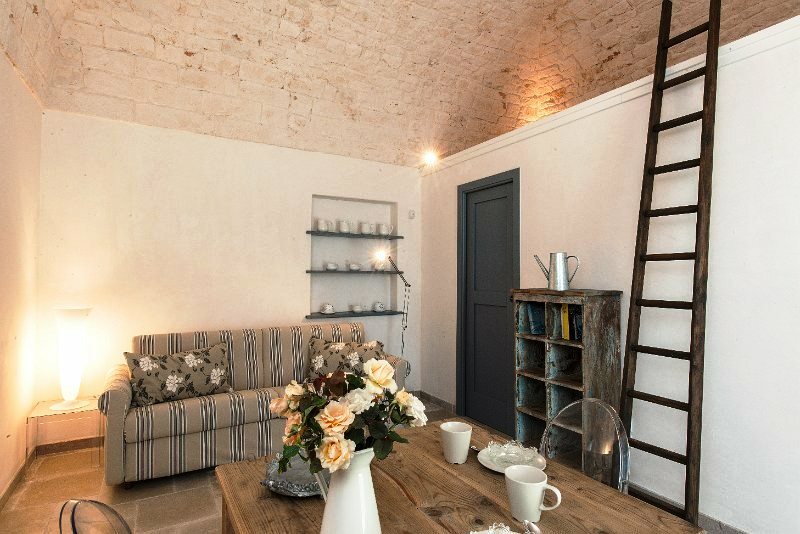 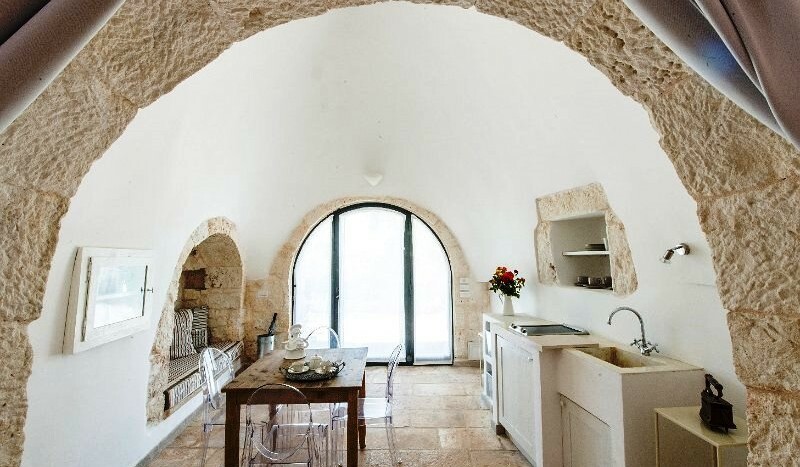 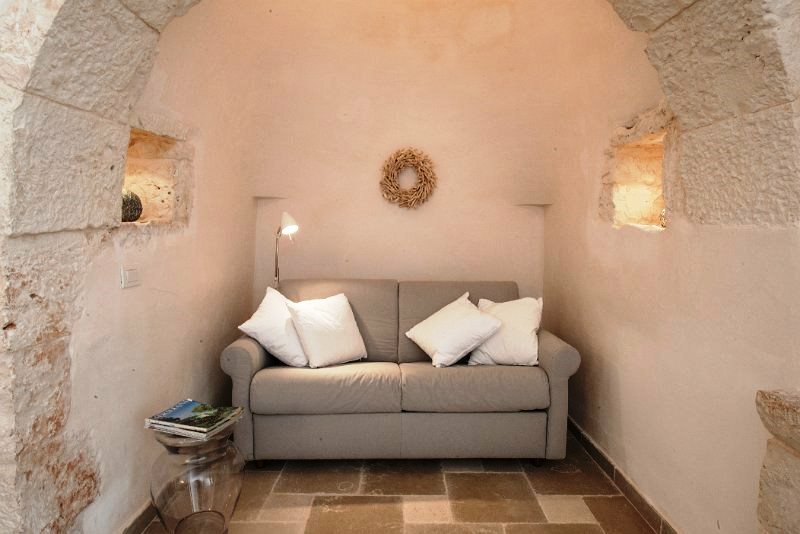 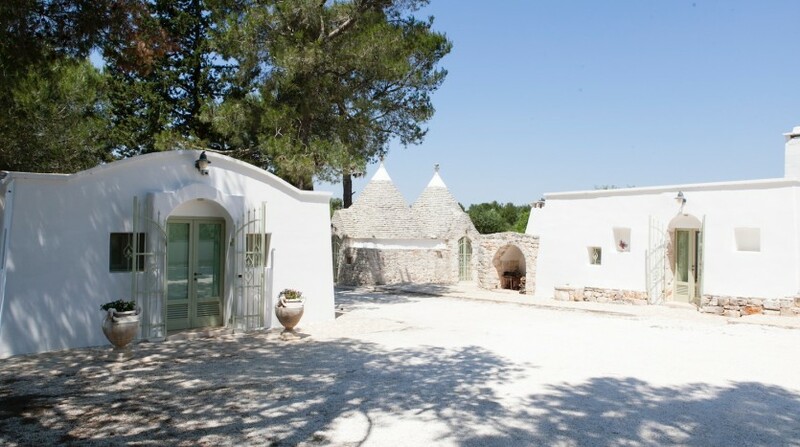 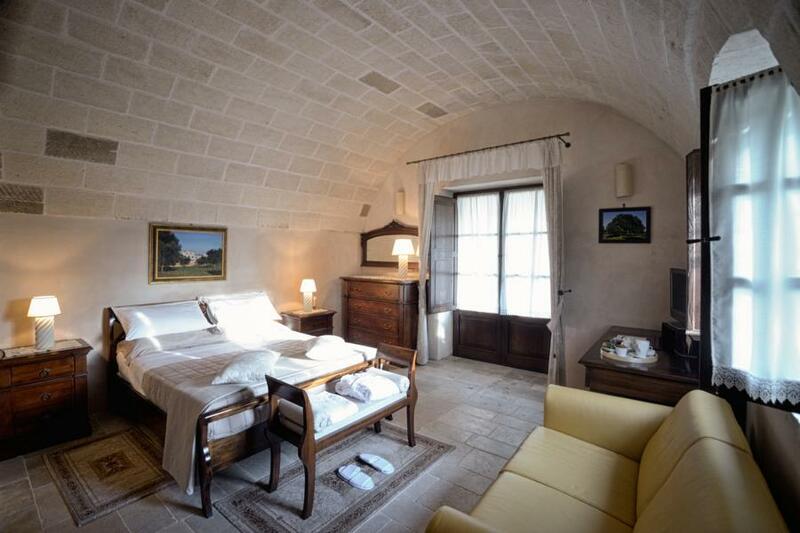 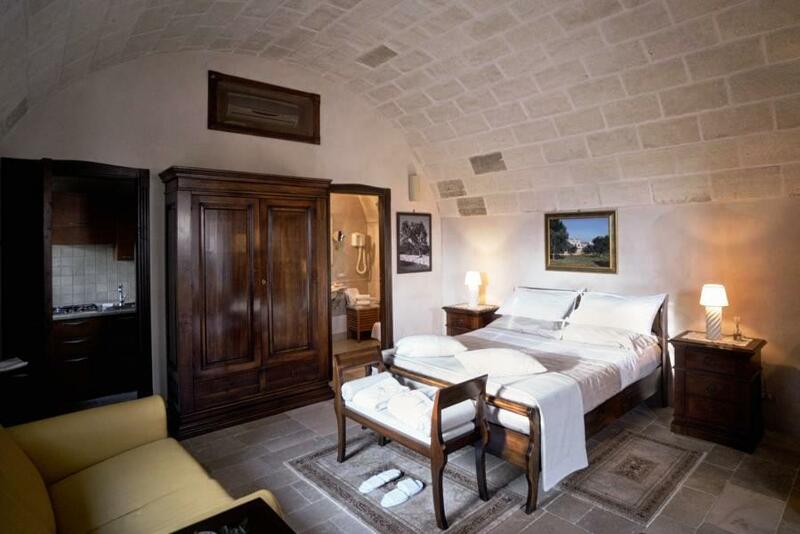 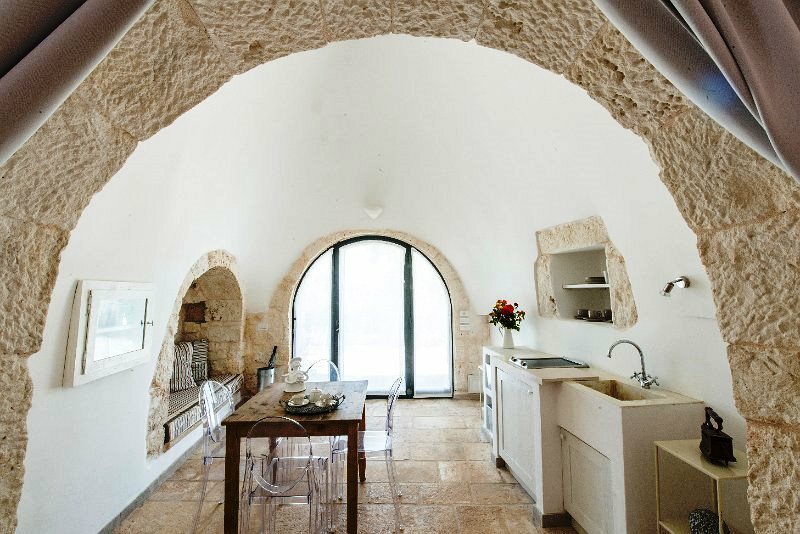 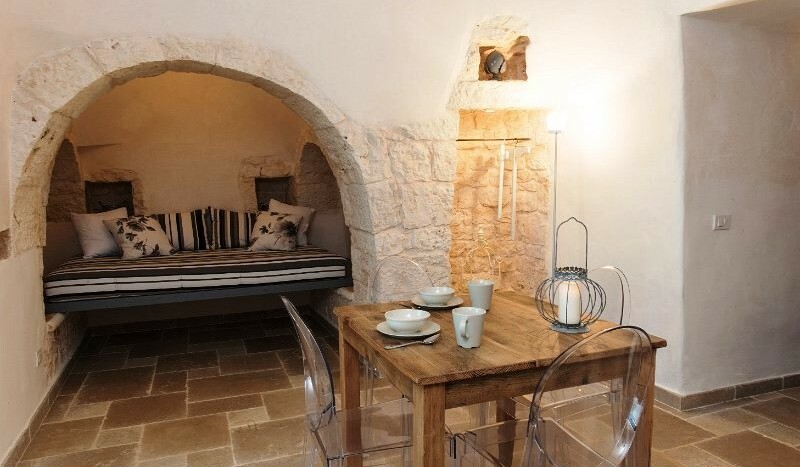 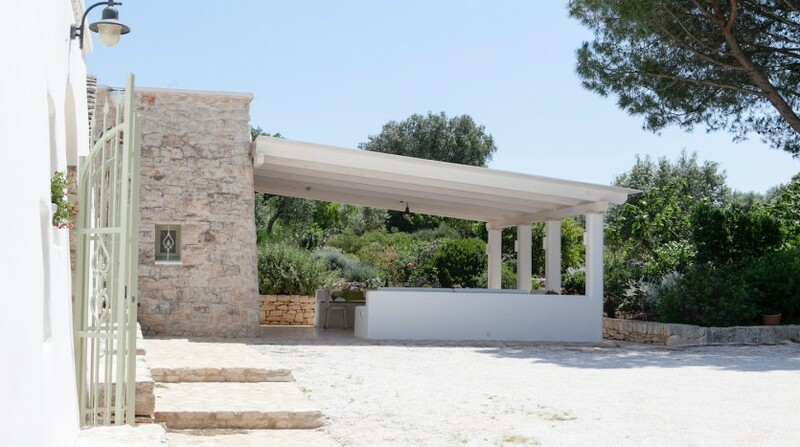 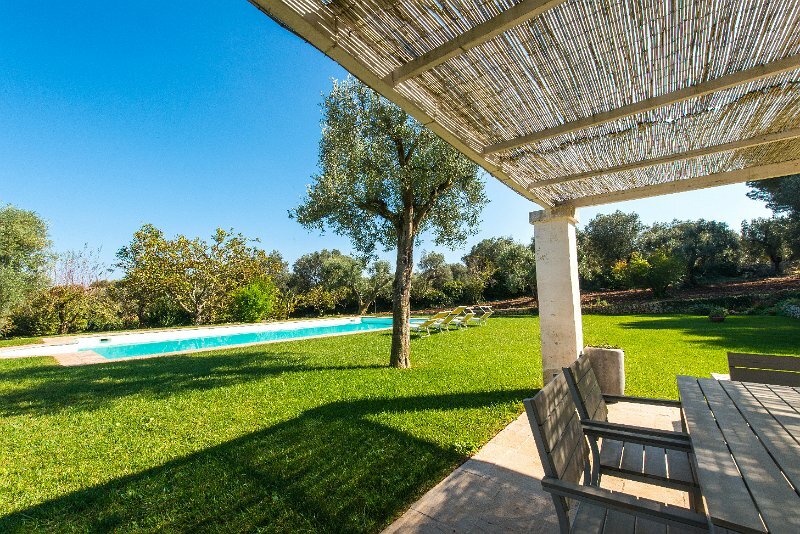 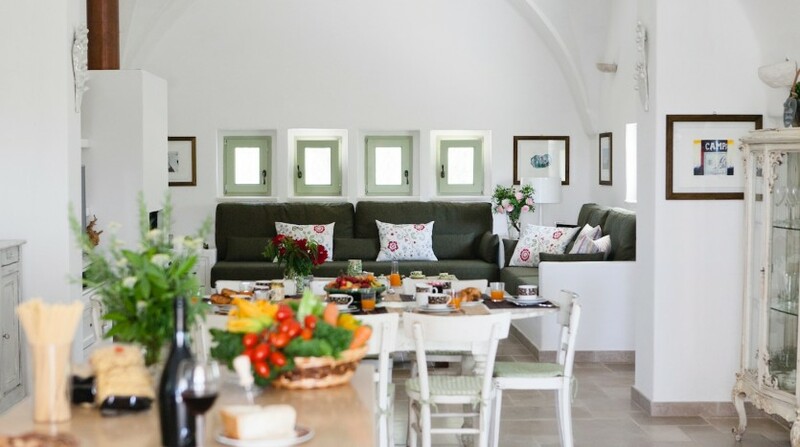 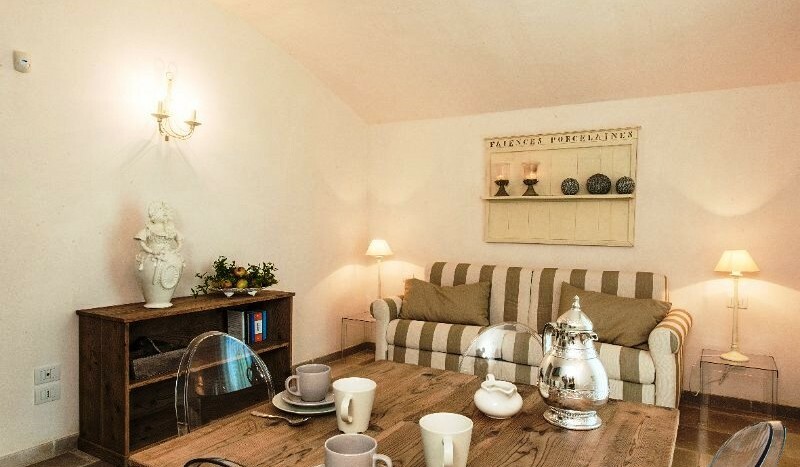 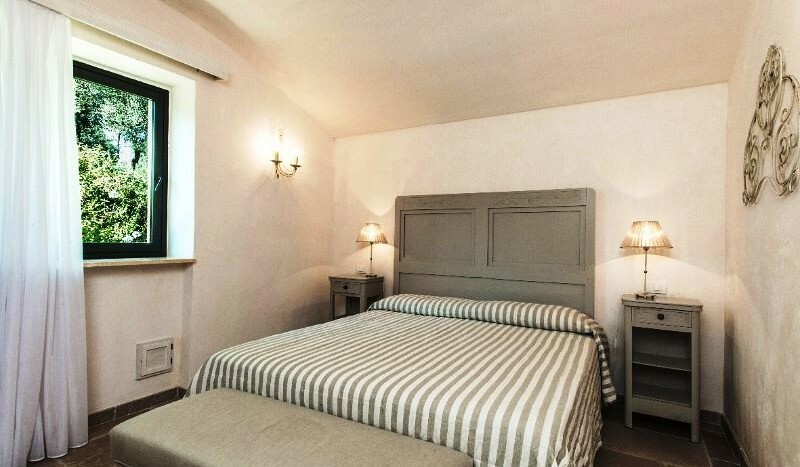 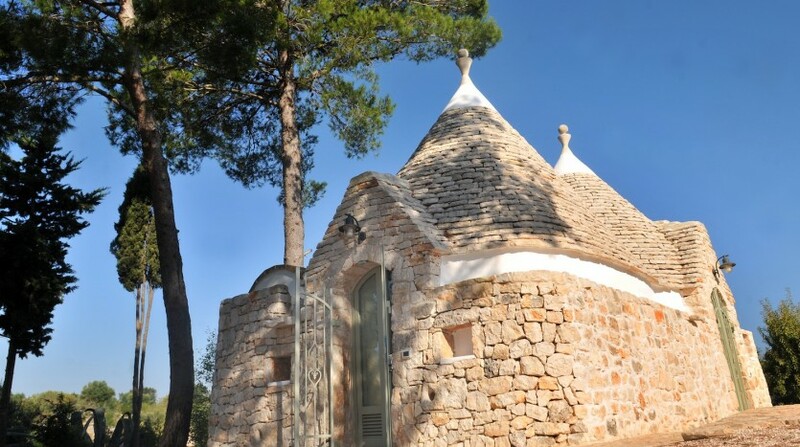 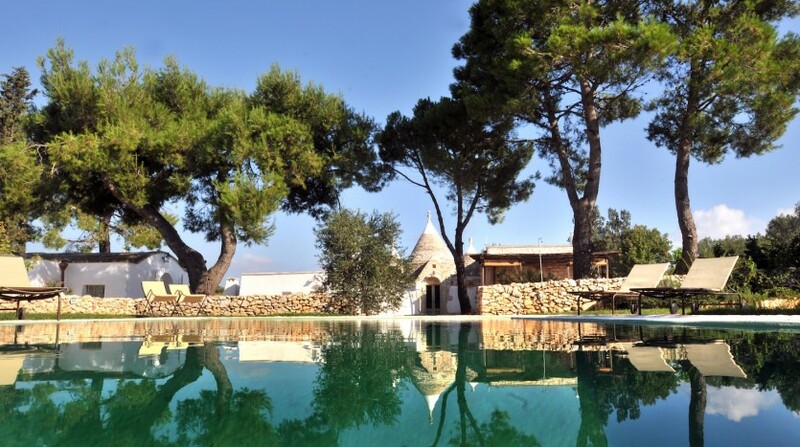 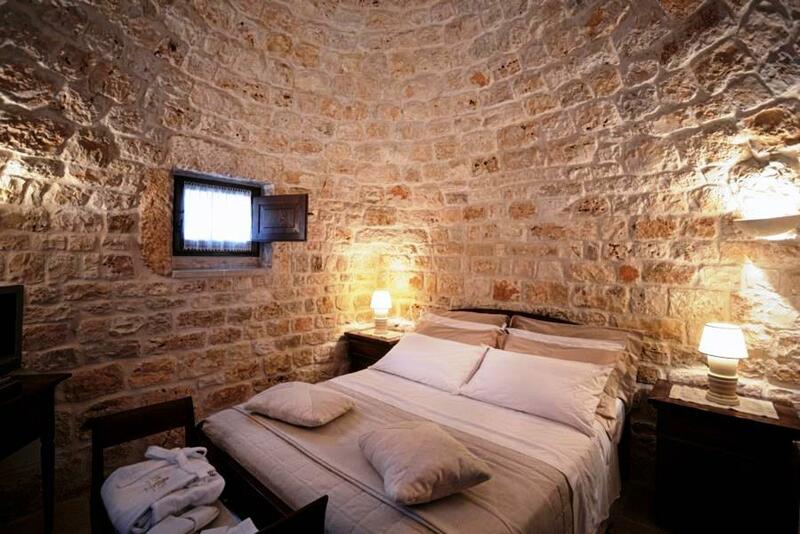 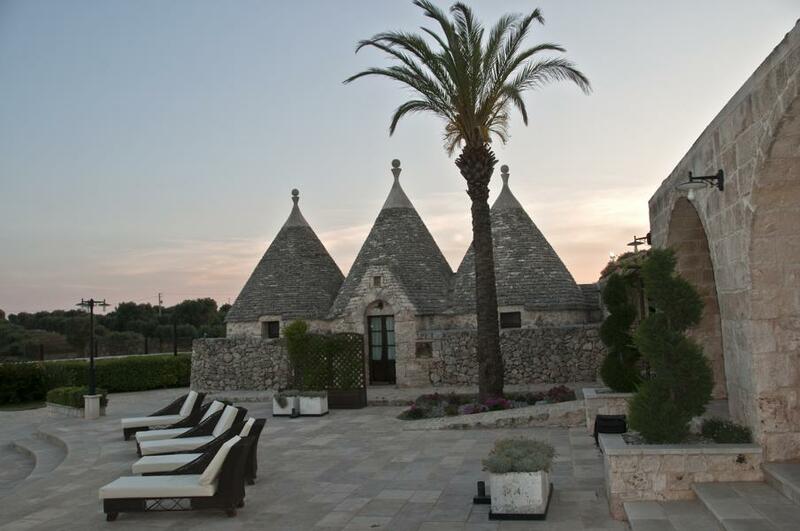 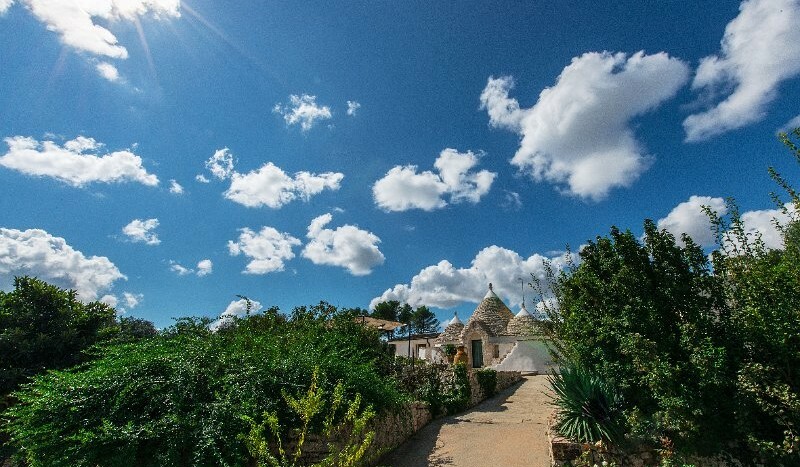 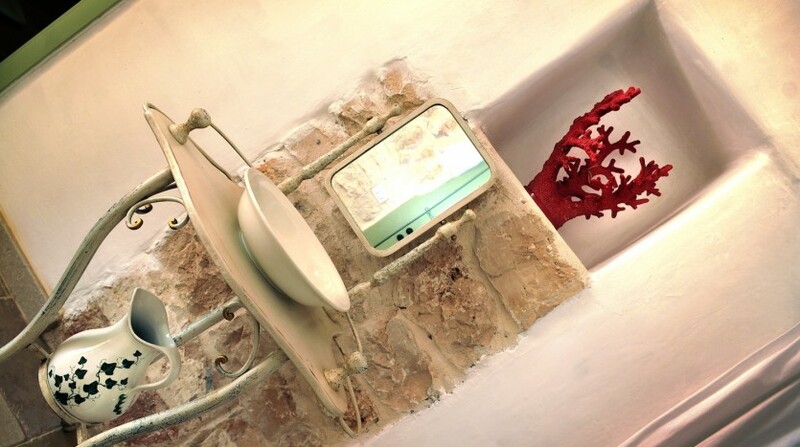 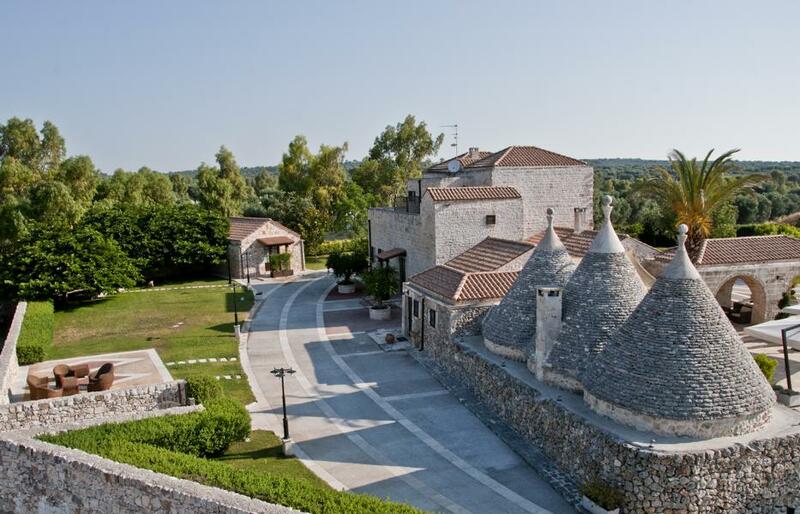 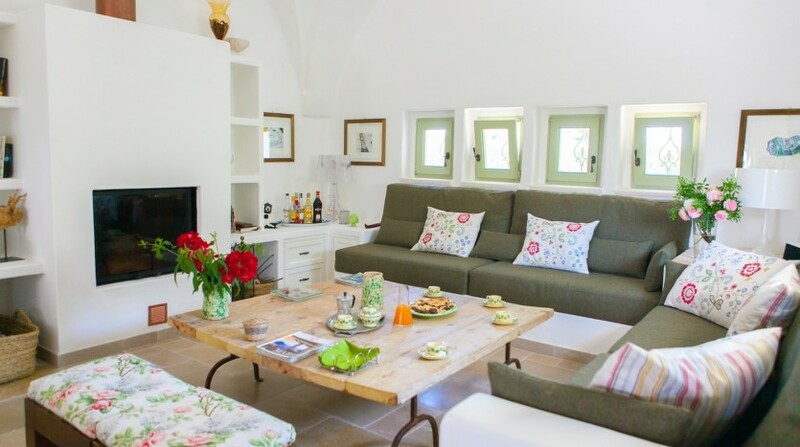 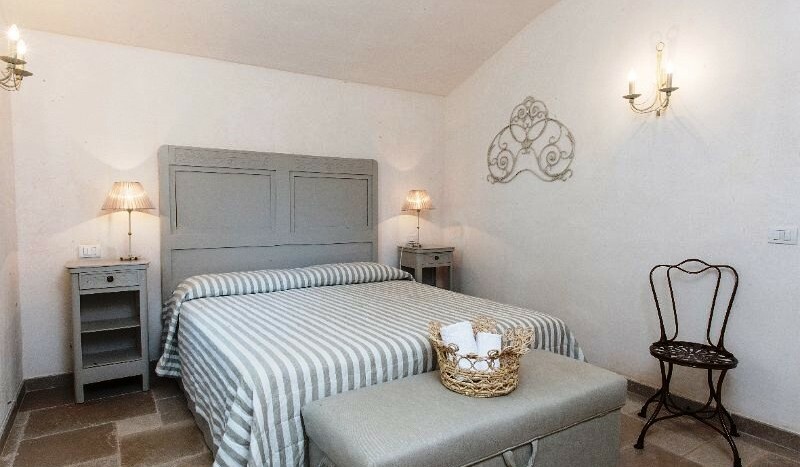 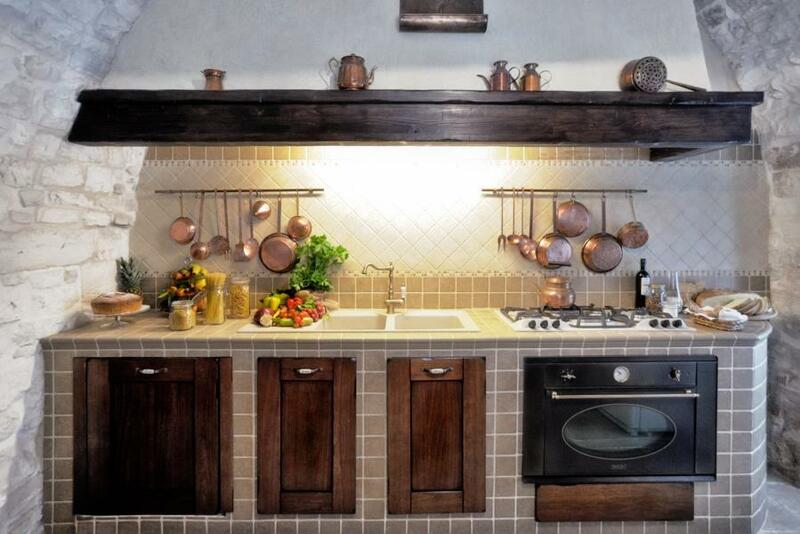 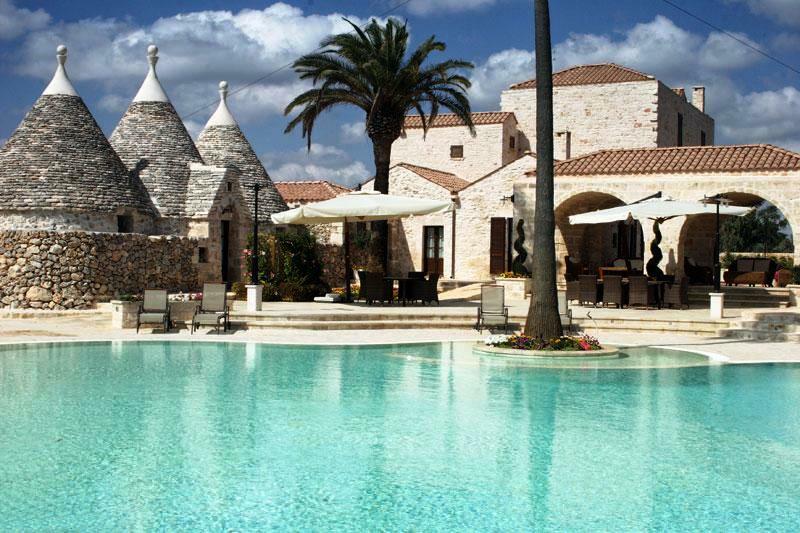 This recently restored 19th century Trullo is the perfect blend of the old and the new. 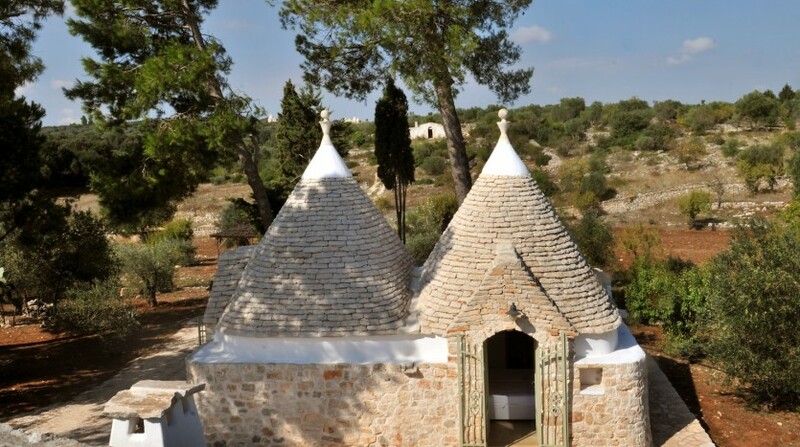 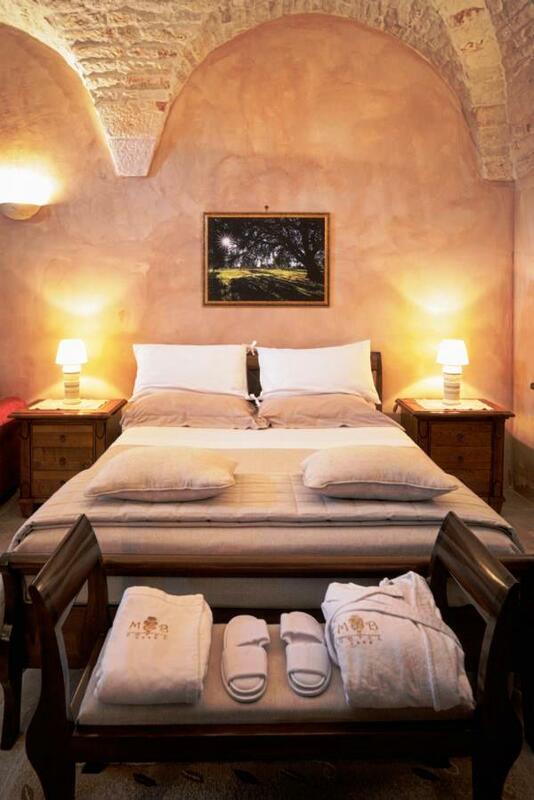 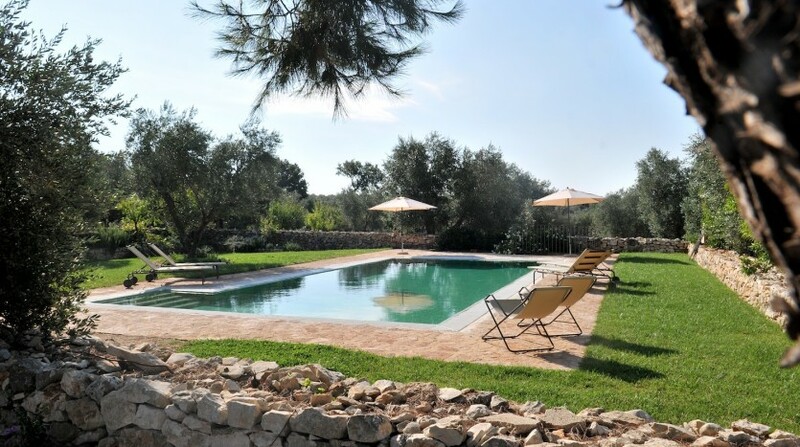 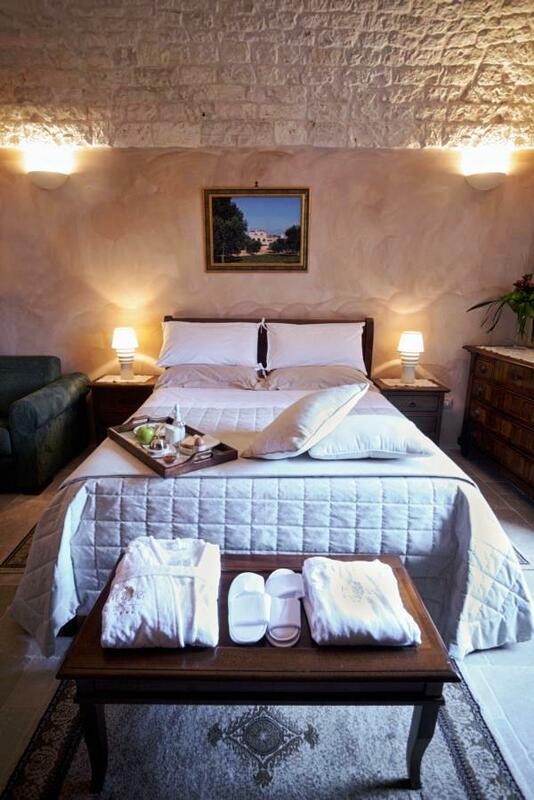 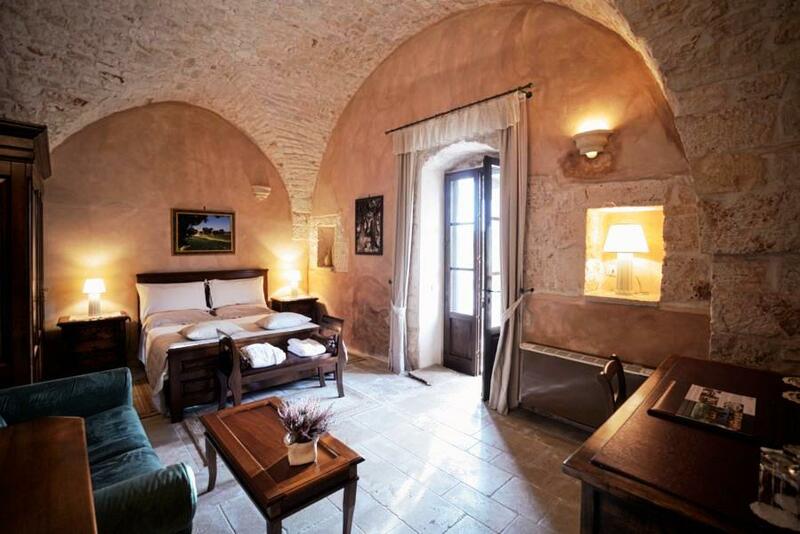 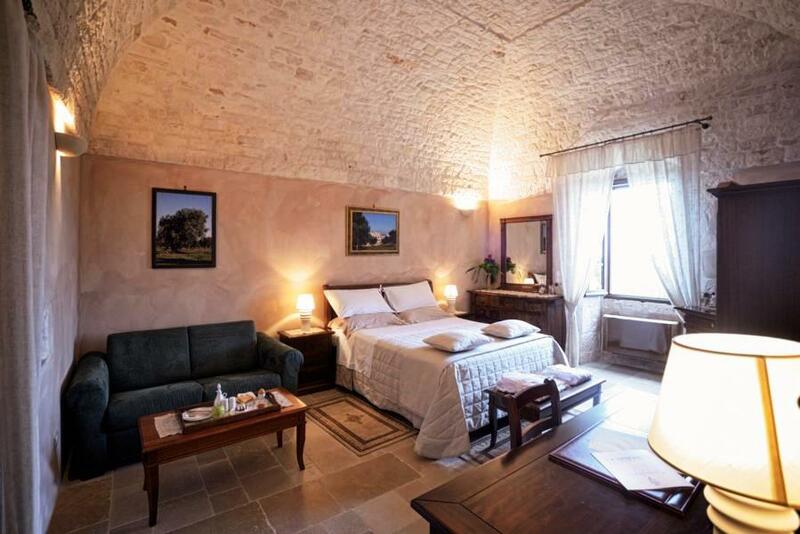 With its distinctive conical shaped roofs, dry stone walls, large terraces and beautiful gardens, The Villa Messapica is a wonderful private retreat in the Puglian countryside.The Trullo is situated in beautiful grounds surrounded by olive groves, some of which are over 120 years old. 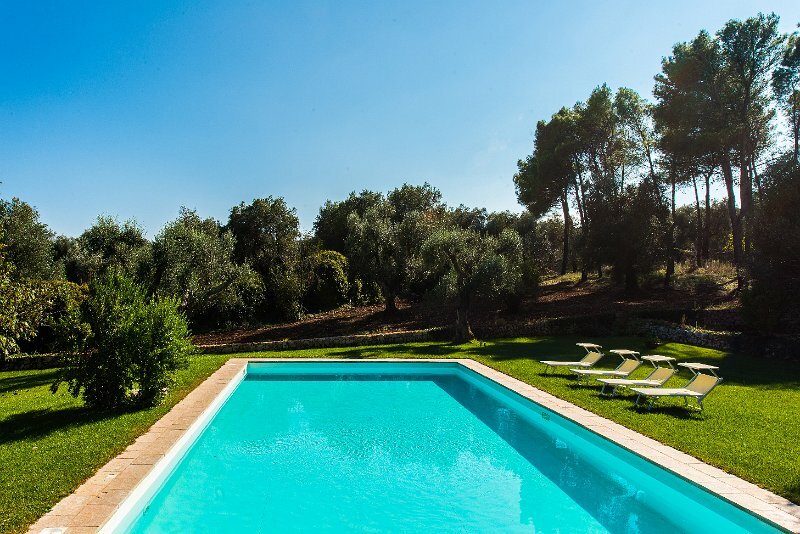 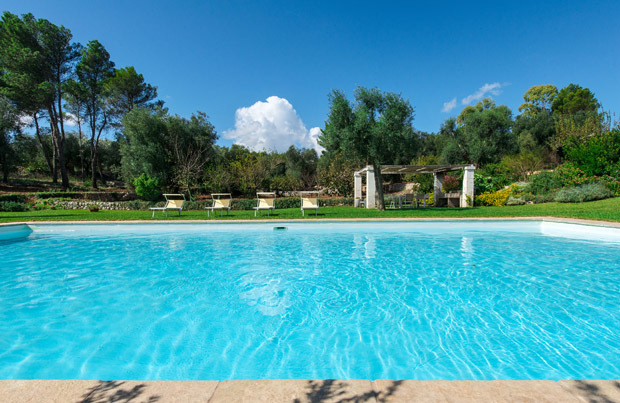 Close to the villa in the gardens is the sparkling well maintained pool. 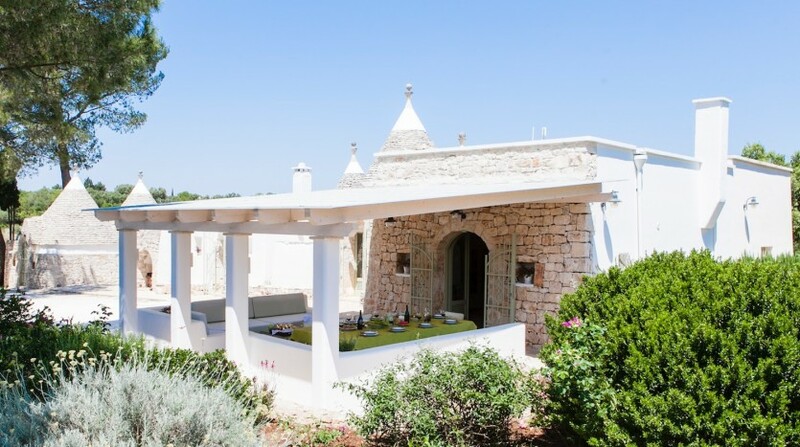 There are plenty of sun loungers around the pool area, along with numerous shady spots to relax and enjoy the warm Puglian sunshine.The lounge and dining area can be accessed through either of the two glass doors on the main terrace. 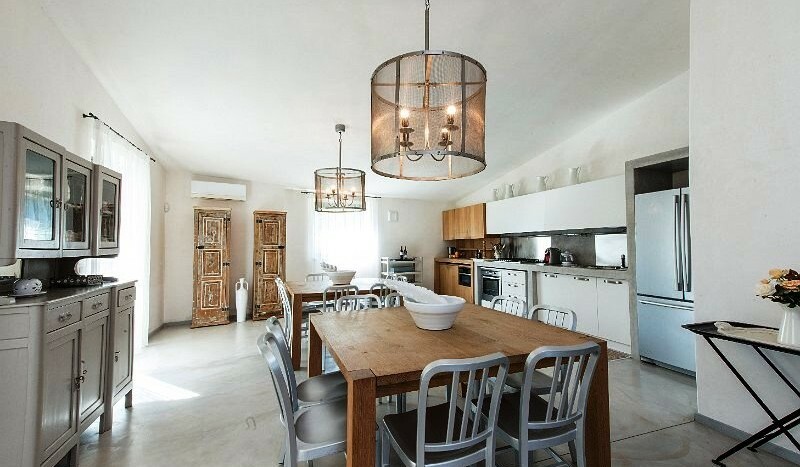 This room is very spacious, airy and bright. 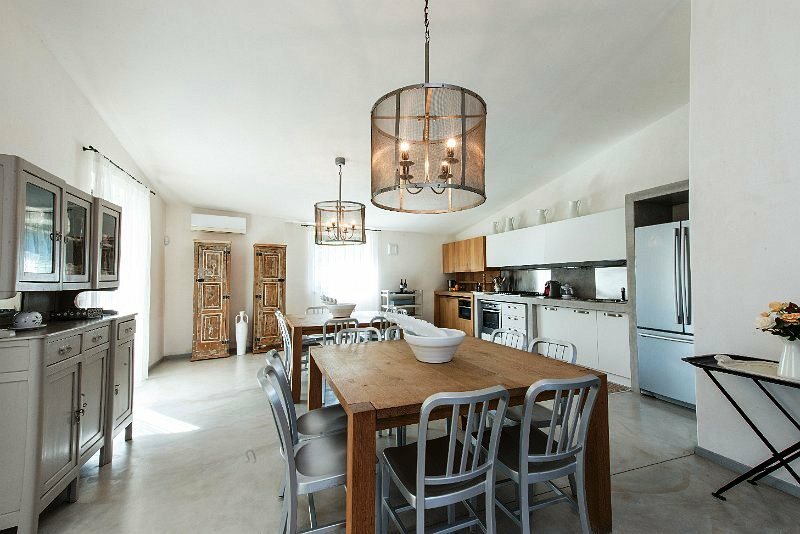 Inside are two large wooden dining tables with seating for 16 people. 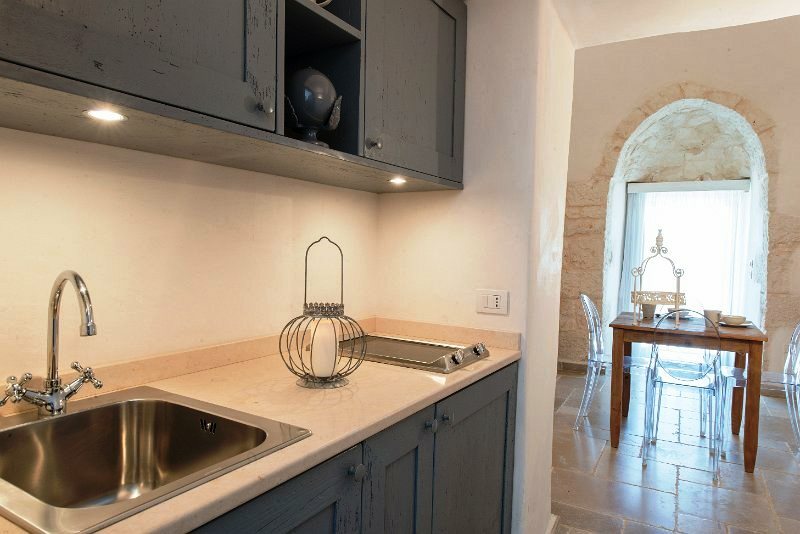 The modern kitchen area contains an oven with gas hobs, microwave, dishwasher and fridge with separate freezer compartment.The lounge area is furnished with a comfortable sofa, marble top coffee table and two wicker chairs. 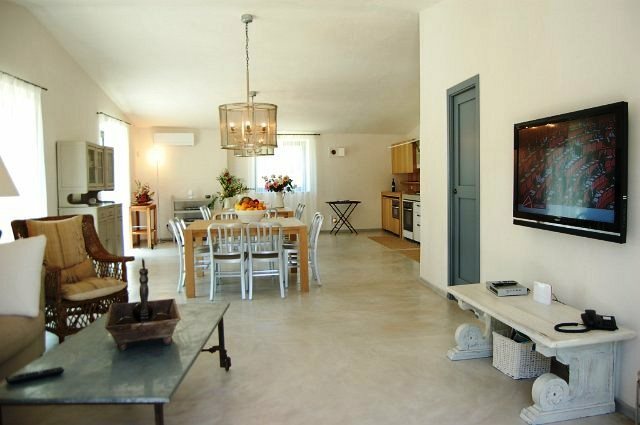 There is a large flat screen television with satellite on one wall. 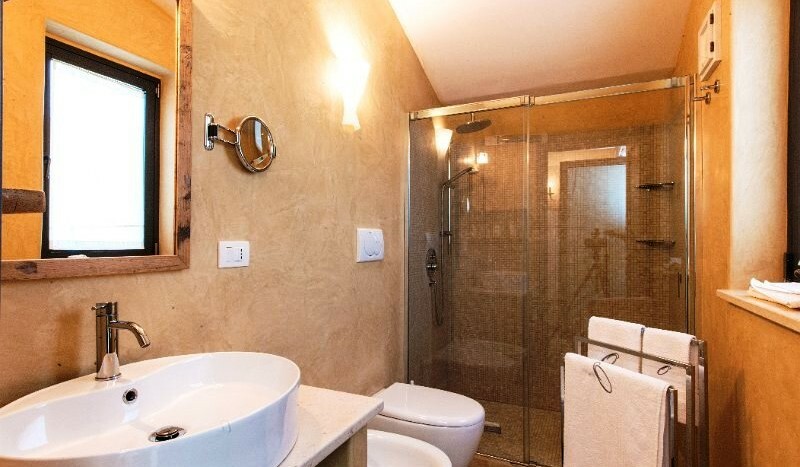 To the right of this area is a bathroom. 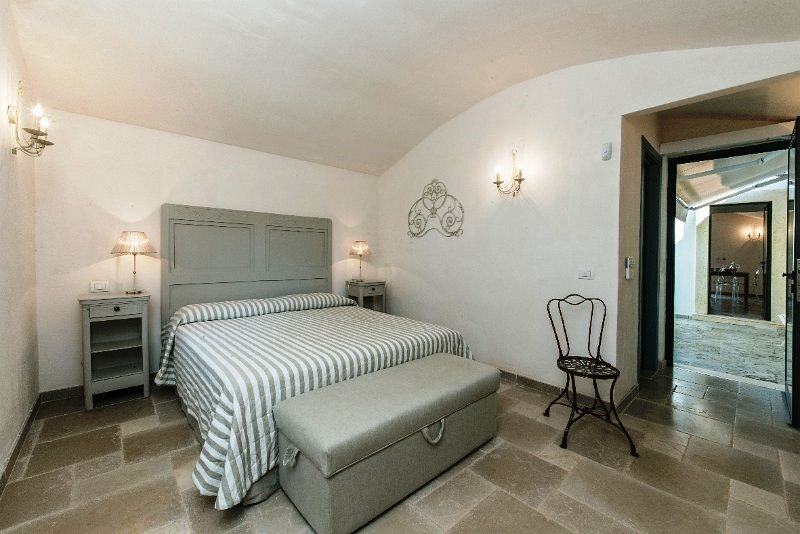 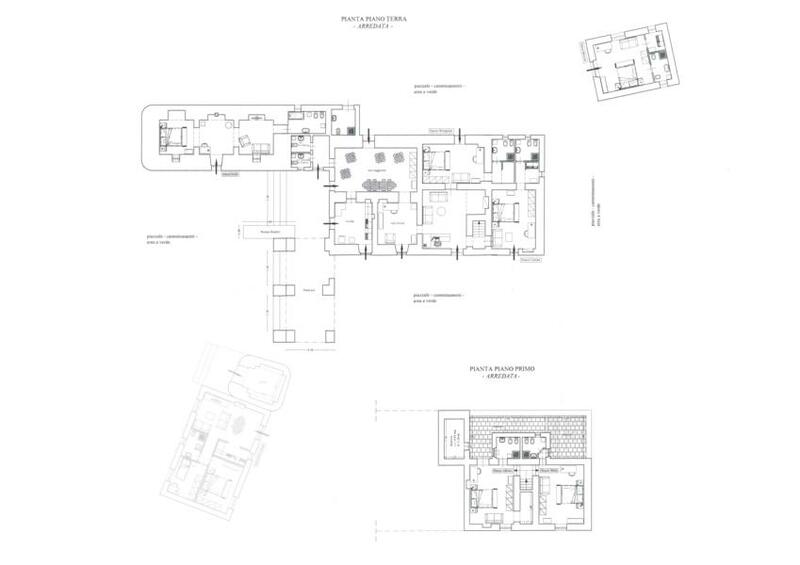 The first suite which is made up of two rooms divided by a small internal garden is located at the far right of the villa. 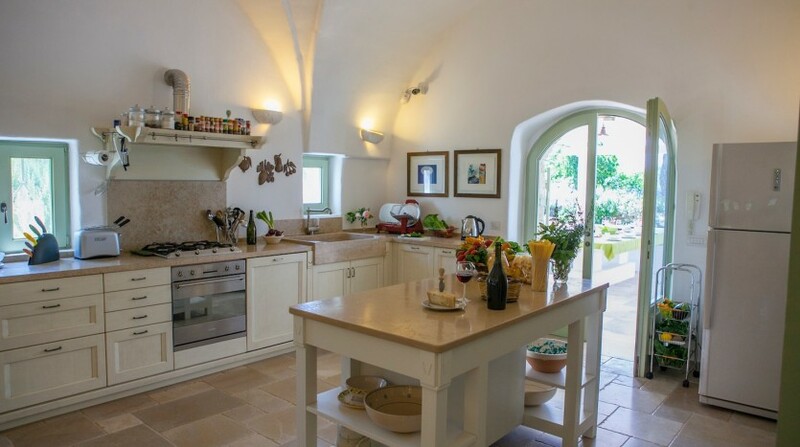 Entering through the main door is the kitchen and lounge. 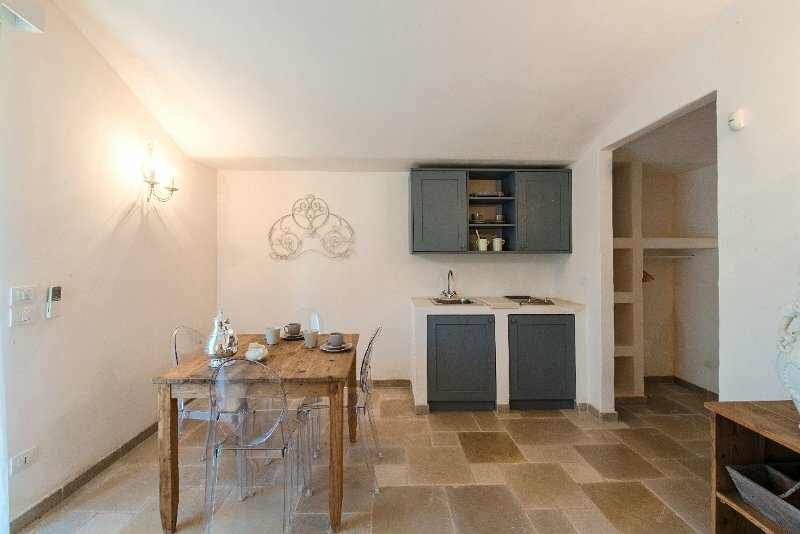 This compact area contains a small dining table with four chairs and a double sofa. 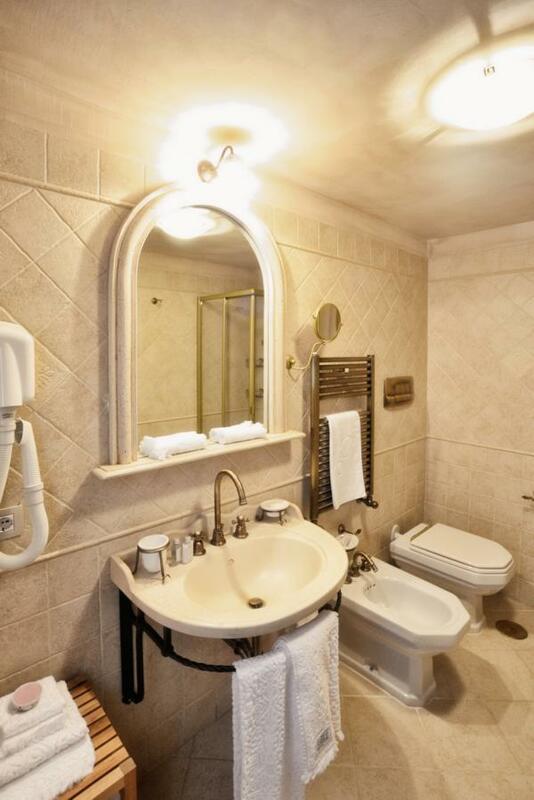 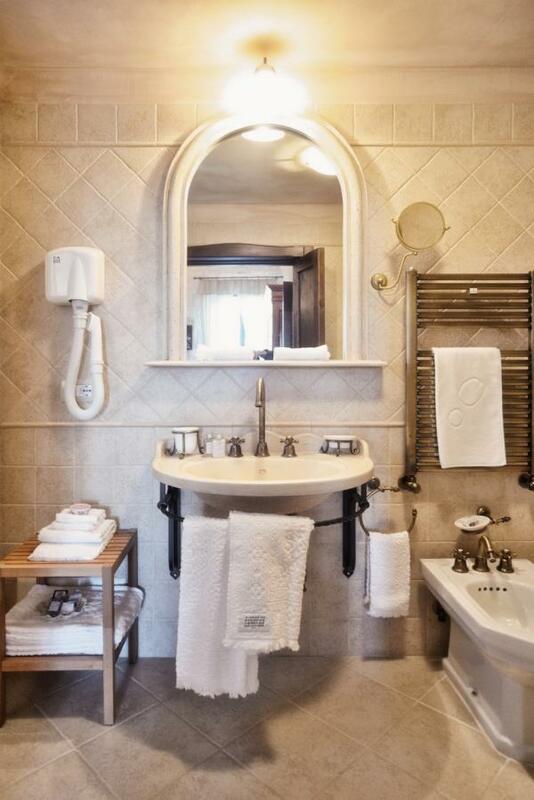 To the right is a bathroom with shower cubicle.The bedroom accessed via the inner garden is a bright room with a double bed and wrought iron chair. 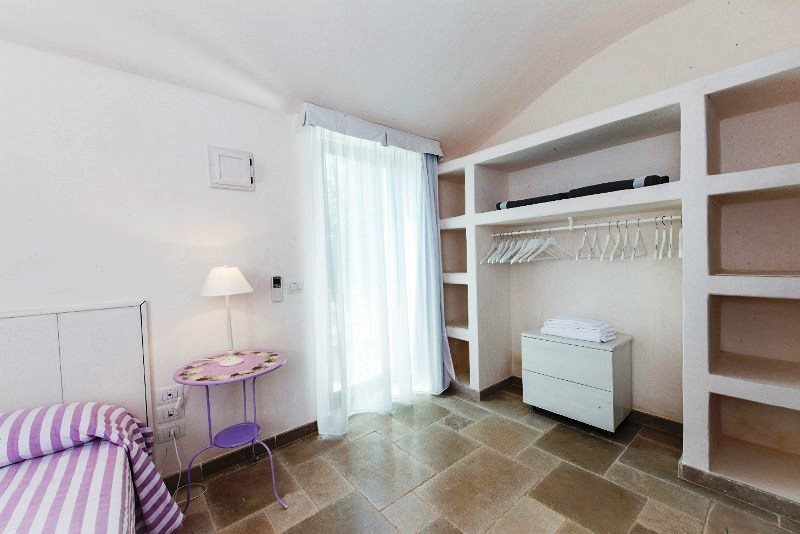 There is an open wardrobe space next to the flat screen television. 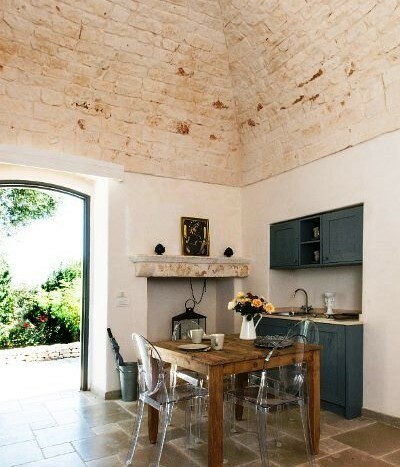 A window in one wall allows plenty of natural light to enter. 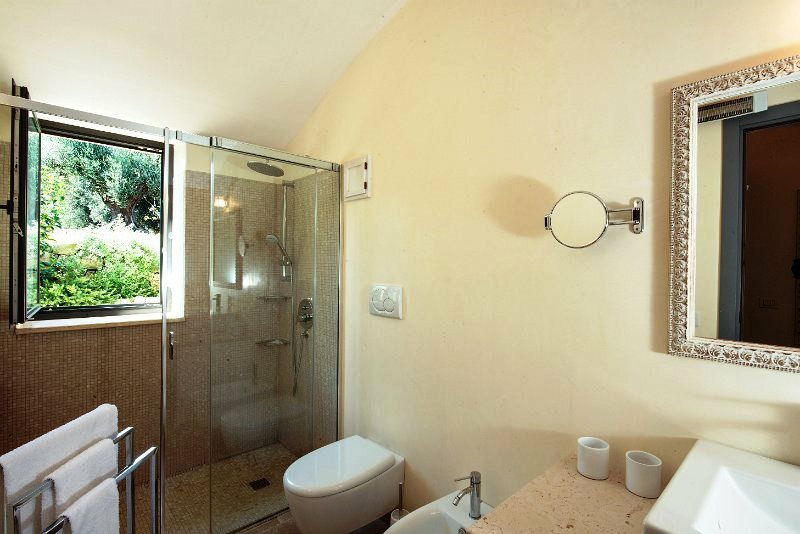 A bathroom with shower cubicle is just outside the room.Entering the second suite is another compact lounge and kitchen. 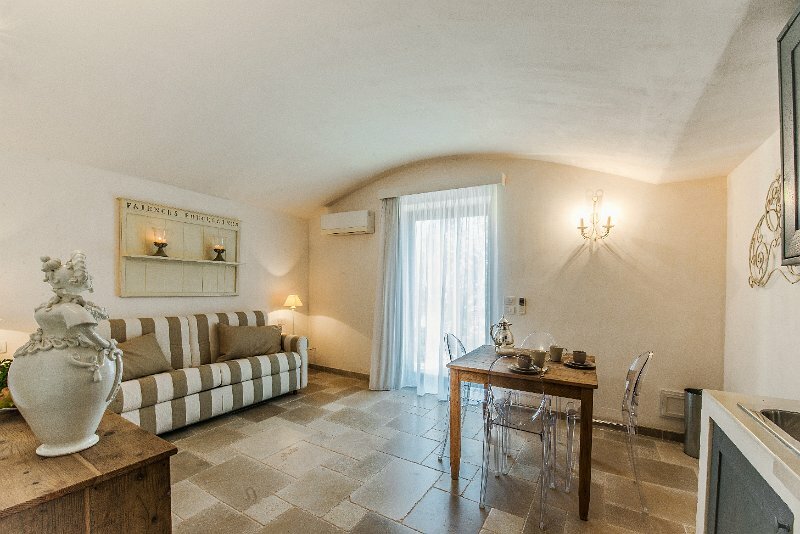 This room like the previous suite contains a double sofa, decorative fireplace and a dining table for 4 people. 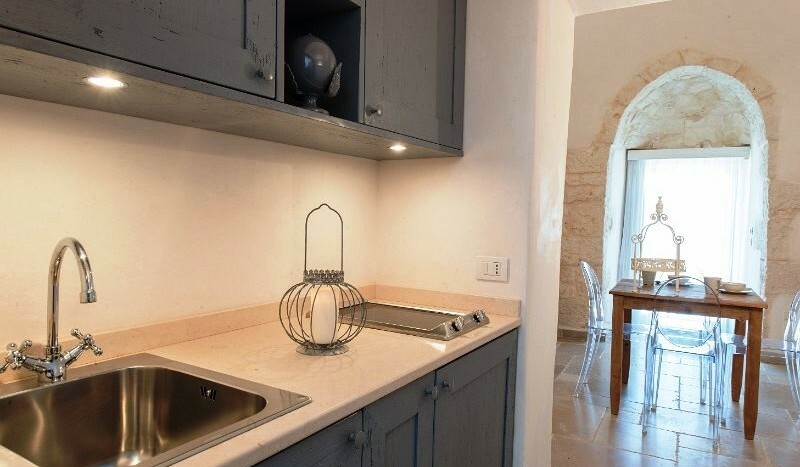 The kitchenette has a small fridge, sink and electric hob. 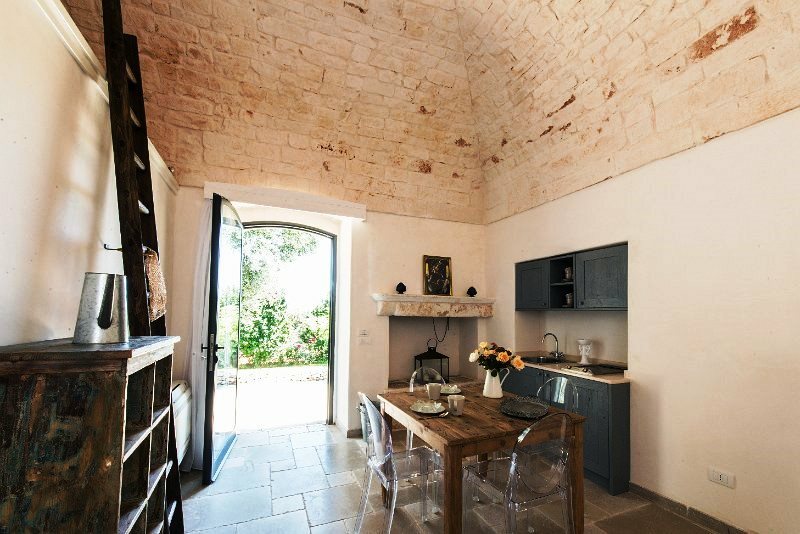 From here there is access to the separate bathroom and bedroom.This well lit room is very bright and airy with its high conical shaped ceiling. 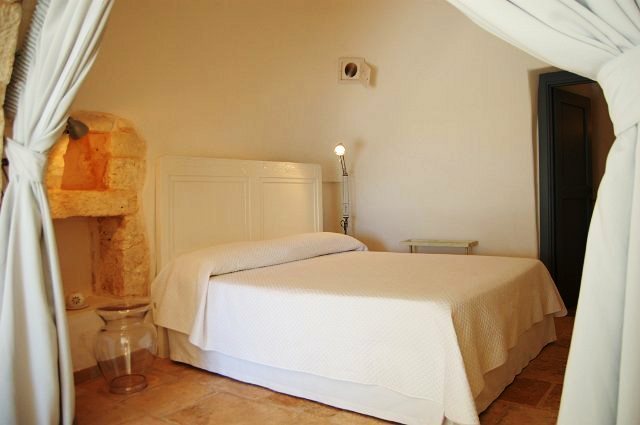 It is furnished with a double bed, chest of drawers and single arm chair. 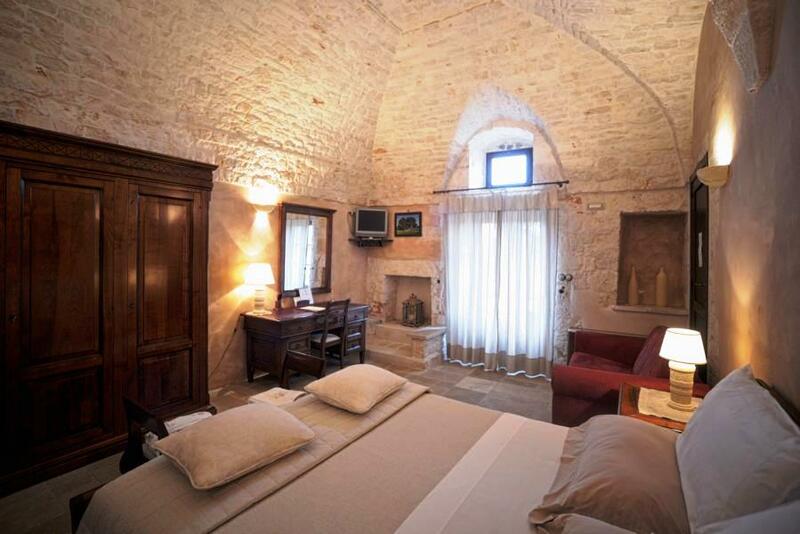 There is a television in one corner of the room. 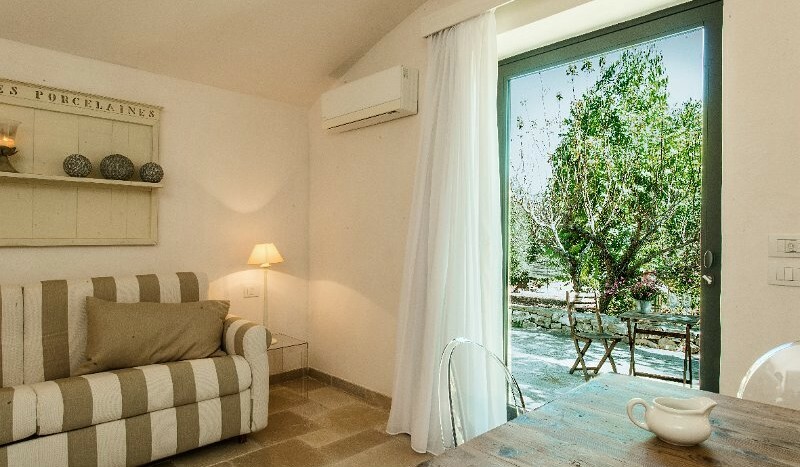 A set of French doors gives direct access to the small garden area.The third suite comprises of three separate rooms and comfortably sleeps 4 people. 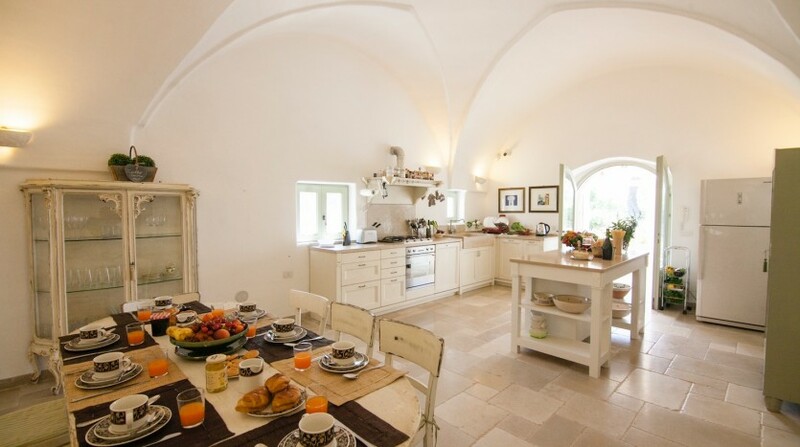 Entering the suite from the front of the villa is the kitchen, it has a sink, electric hob and small fridge. 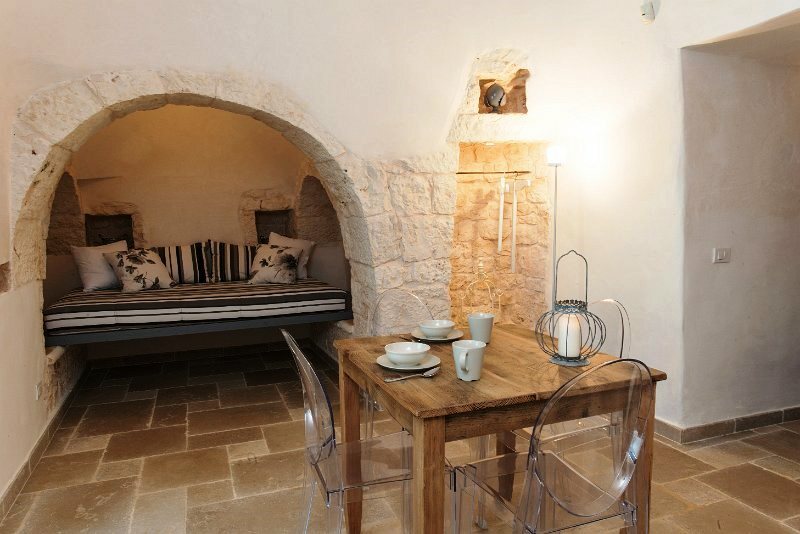 There is a wooden dining table that seats 4 people.Through an archway and up one step is a bedroom with double bed. 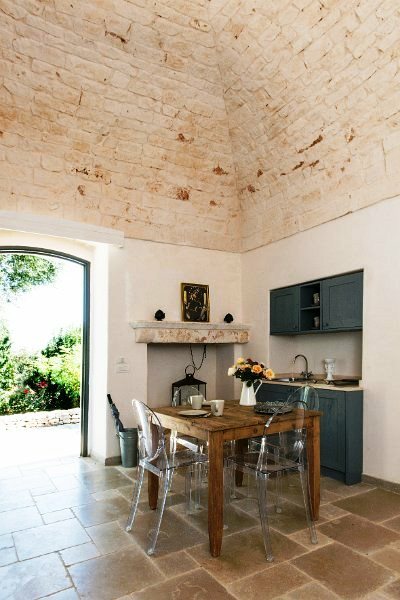 This room is very bright with a conical shaped ceiling. 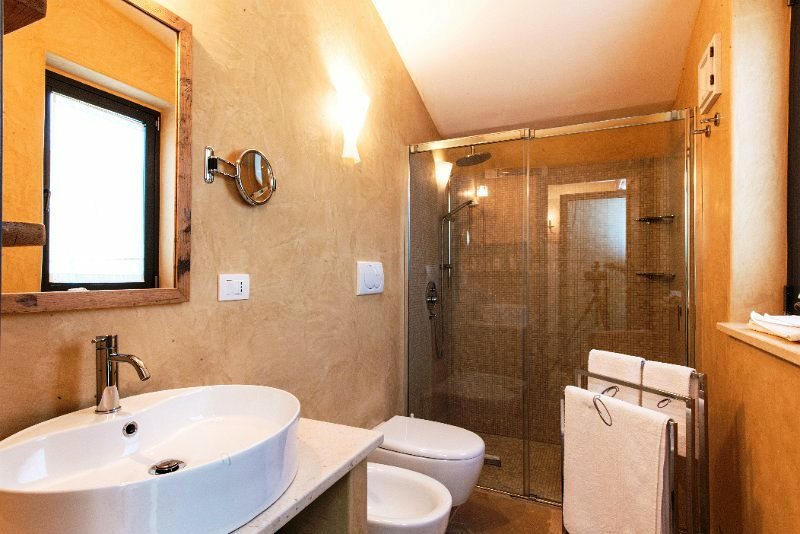 A door leads to the twin bedroom and bathroom with separate shower cubicle. 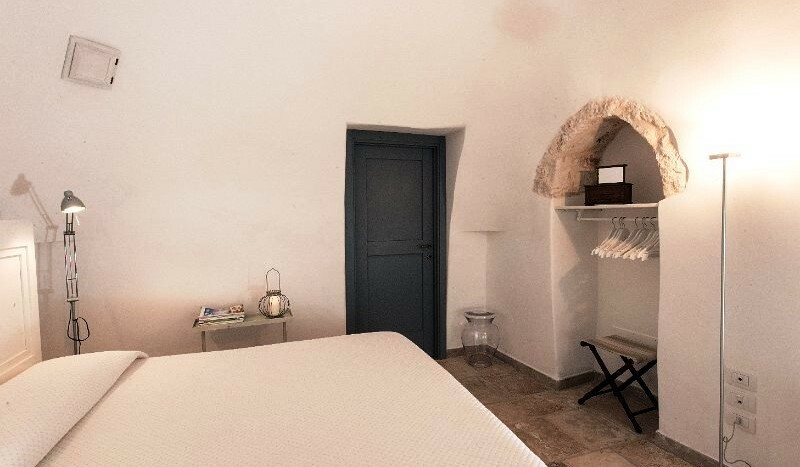 A curtain can be drawn across the archway for privacy.The compact twin room is furnished with two single beds and a small table. 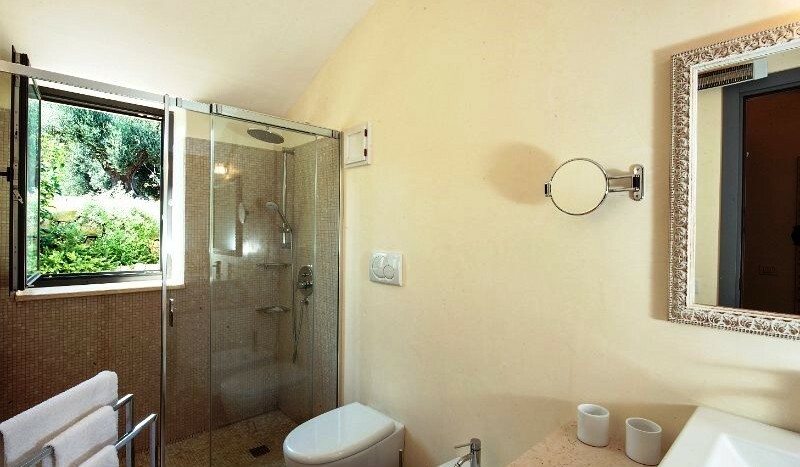 There is easy access to the bathroom with separate shower cubicle. 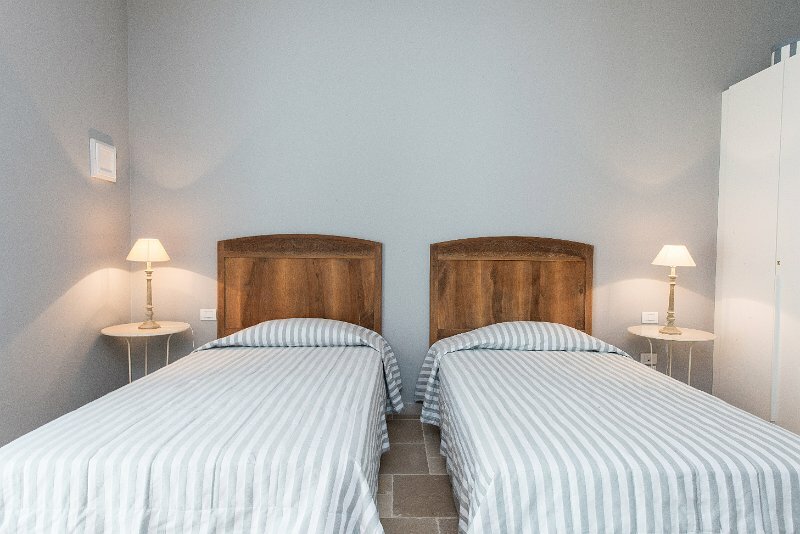 The twin beds can not be converted into a double. 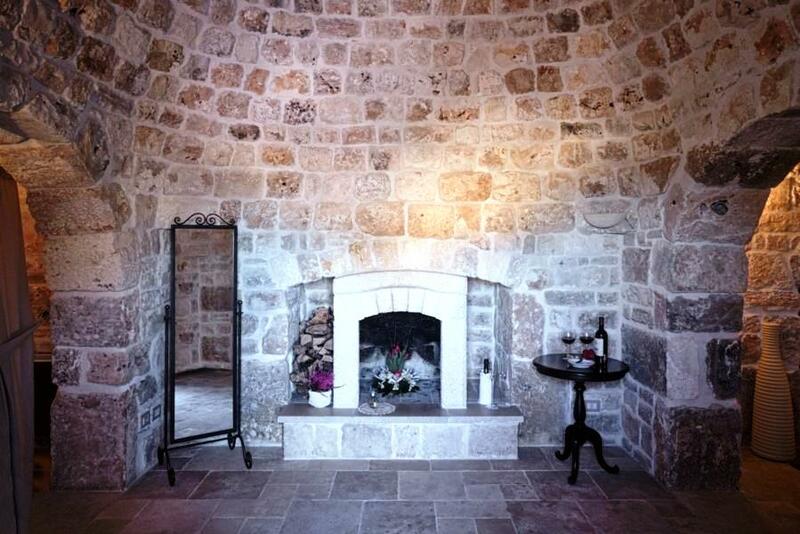 The fourth suite is the most characteristic of all. 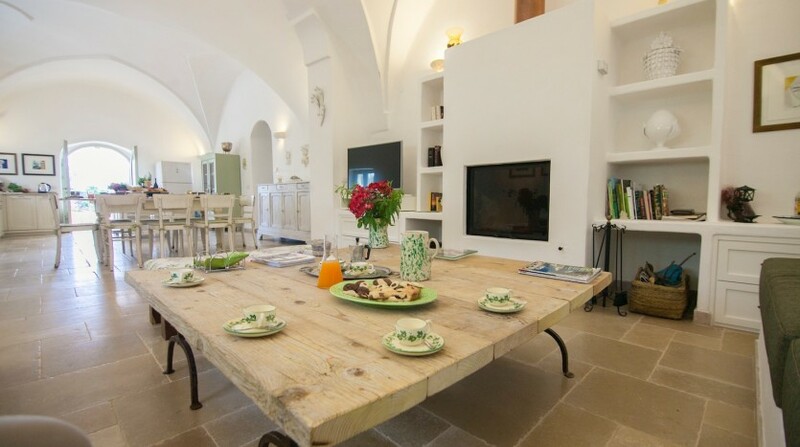 Entering into the lounge and dining area is a small table with seating for 4 people. 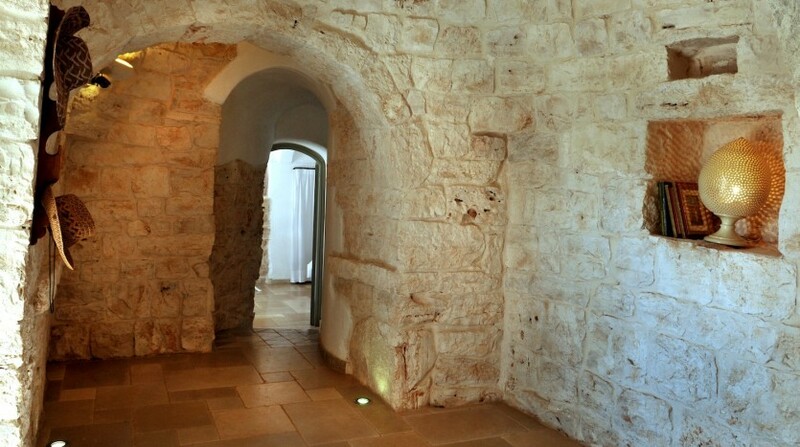 Either side of the room are two arched alcoves. 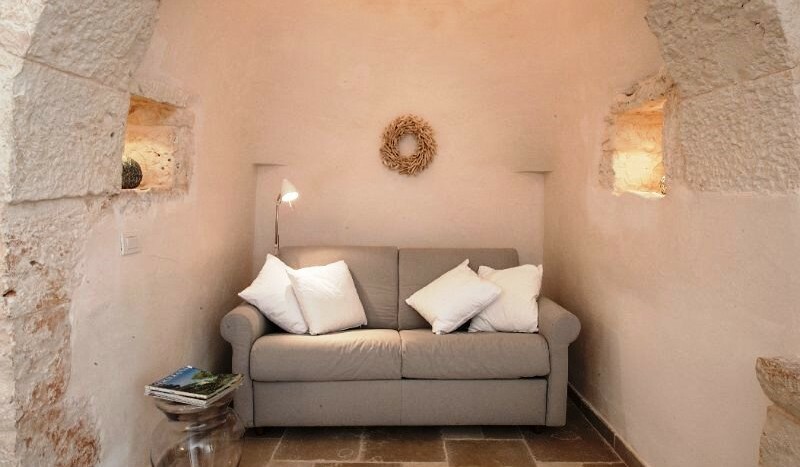 The left alcove contains a single raised sofa with cushions, while the right alcove has a two seater sofa. 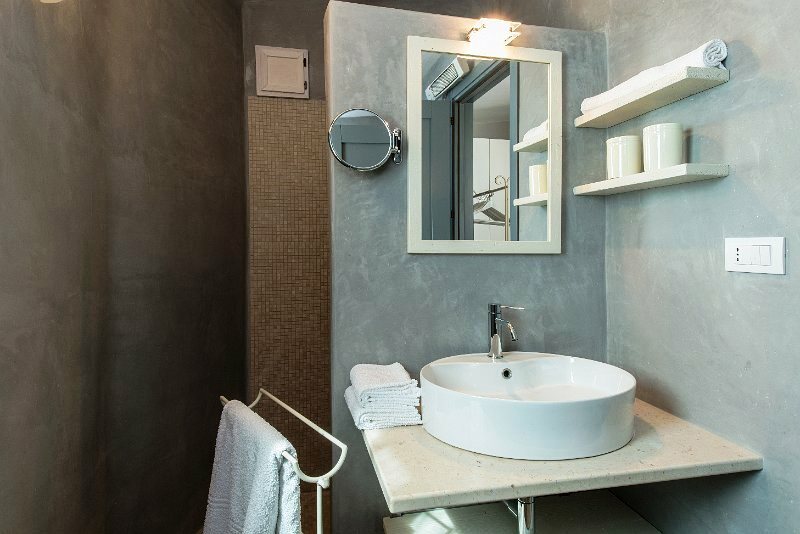 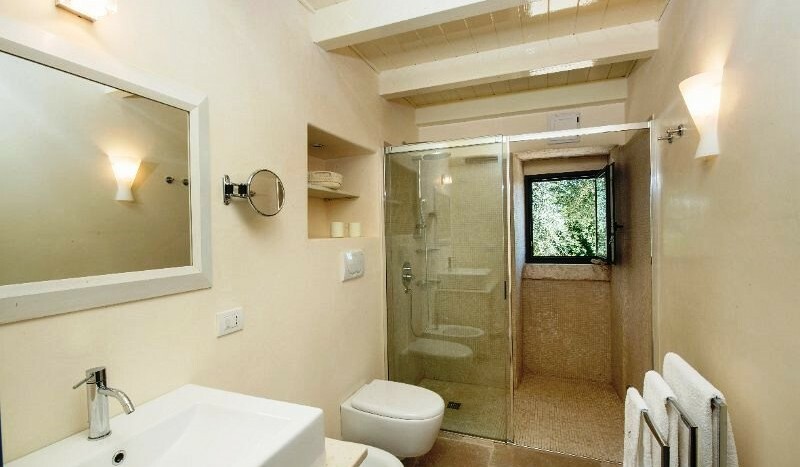 A short corridor leads to the bedroom and bathroom with shower cubicle. 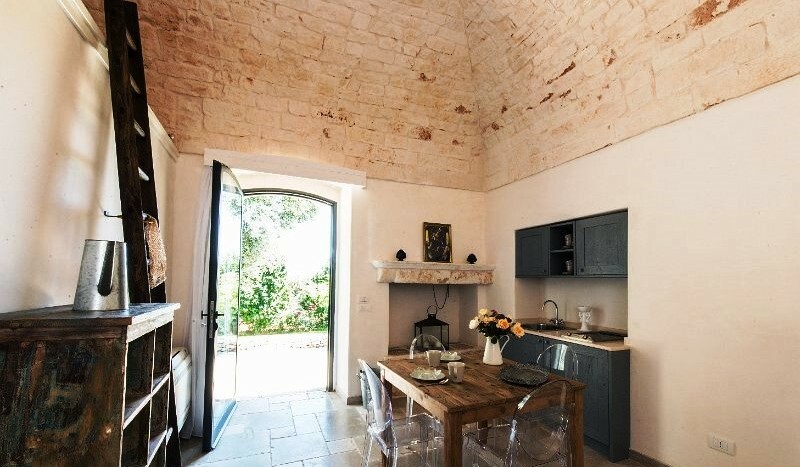 Midway along the corridor is the kitchenette with sink, small fridge and electric hob.This bright room with its flagstone floor is furnished with a double bed and chair. 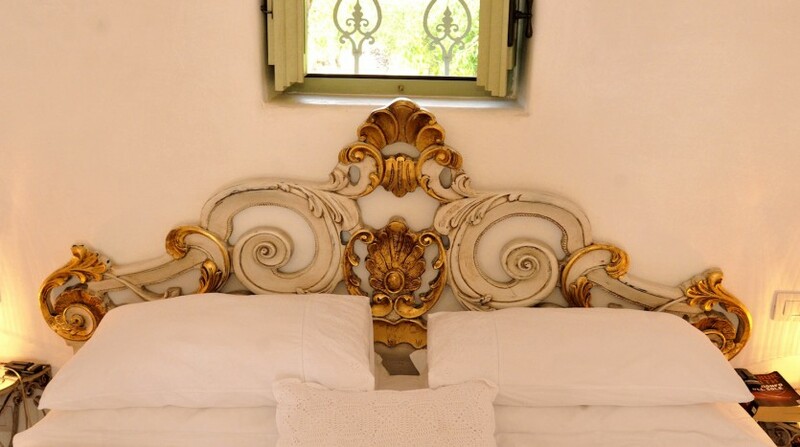 The double bed has a modern shelving surround with decorative drapes. 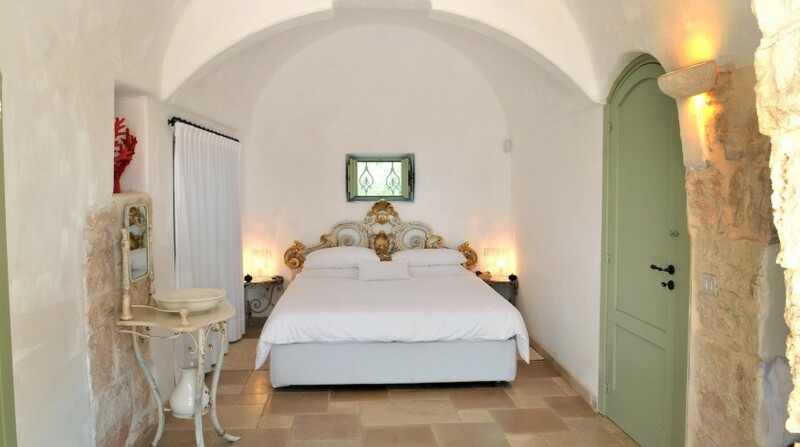 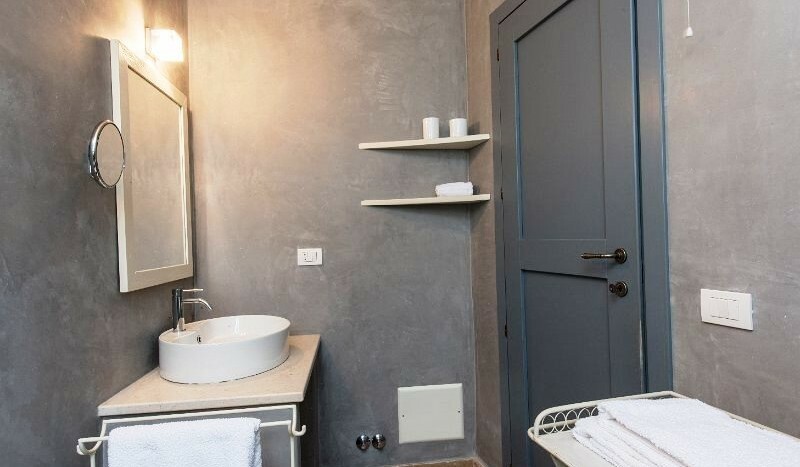 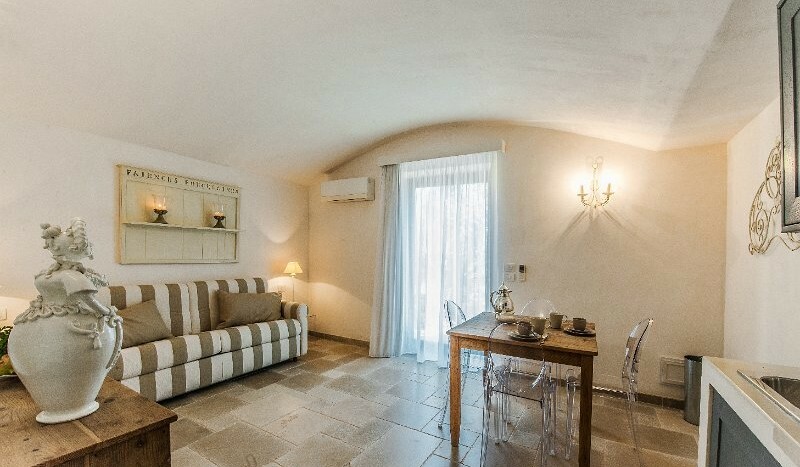 There is a door leading from the room to one of the internal gardens.Access to this one room suite is from the back of the villa, Inside are two twin beds and a television. 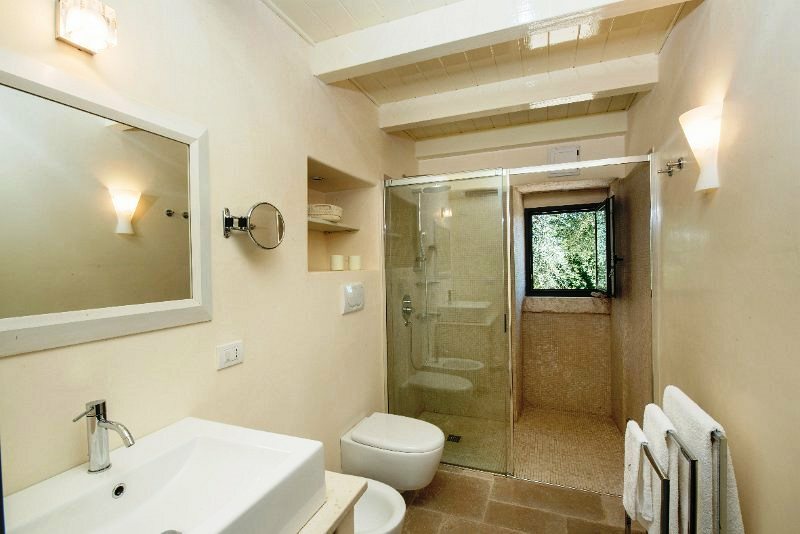 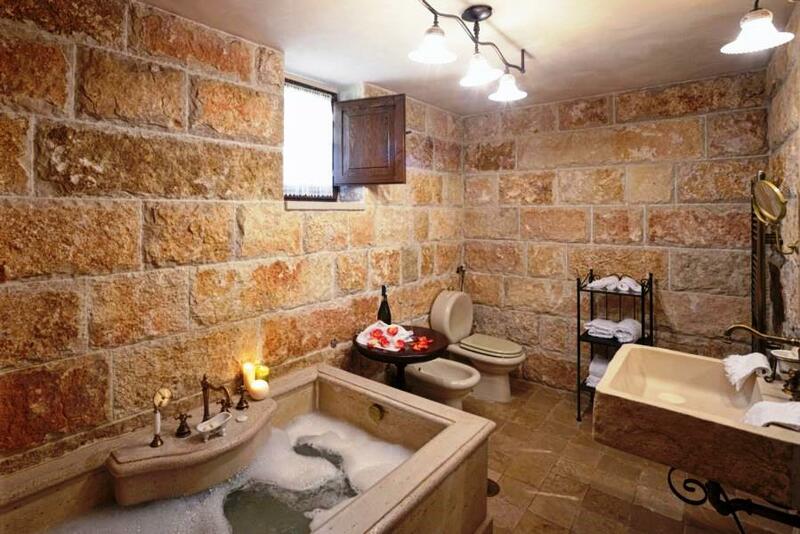 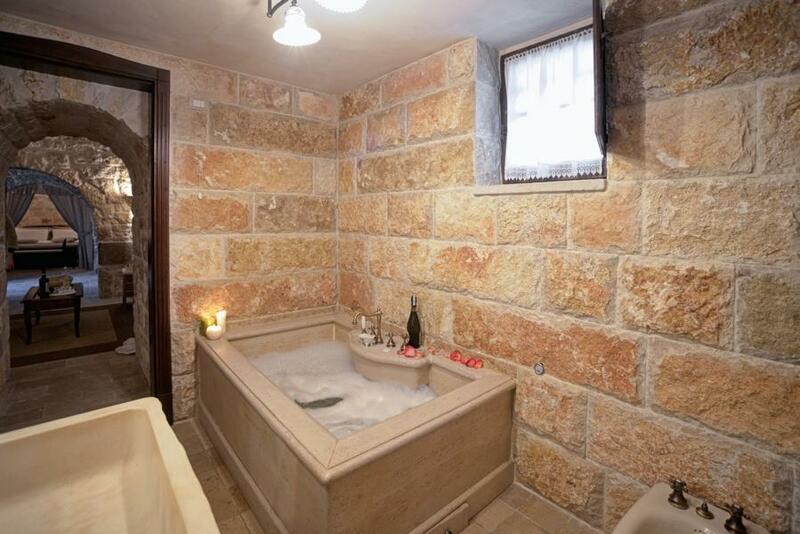 There is also an en-suite bathroom with separate shower cubicle. 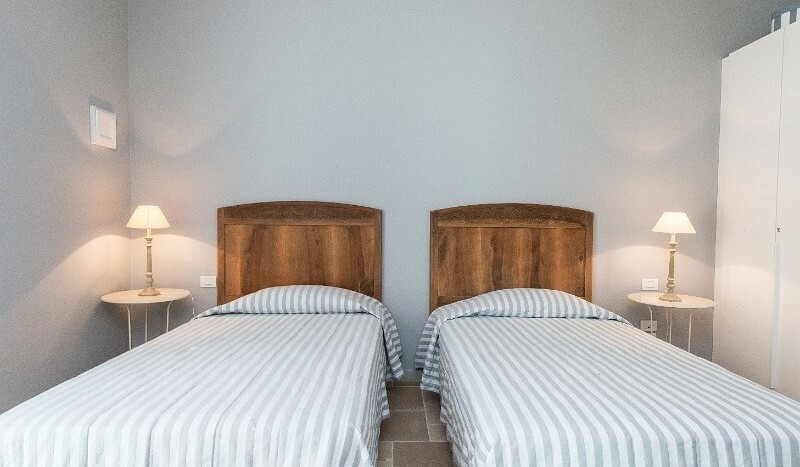 The twin beds can not be made into a double. 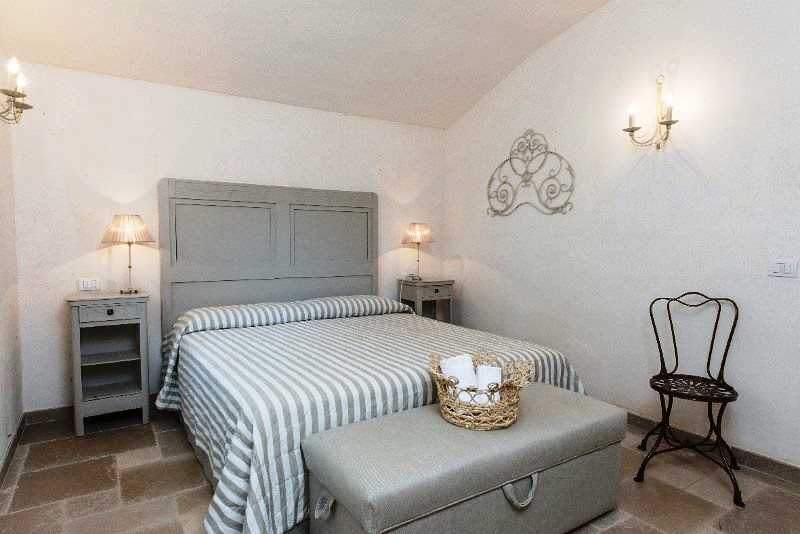 – 4 double beds, 2 twin beds. 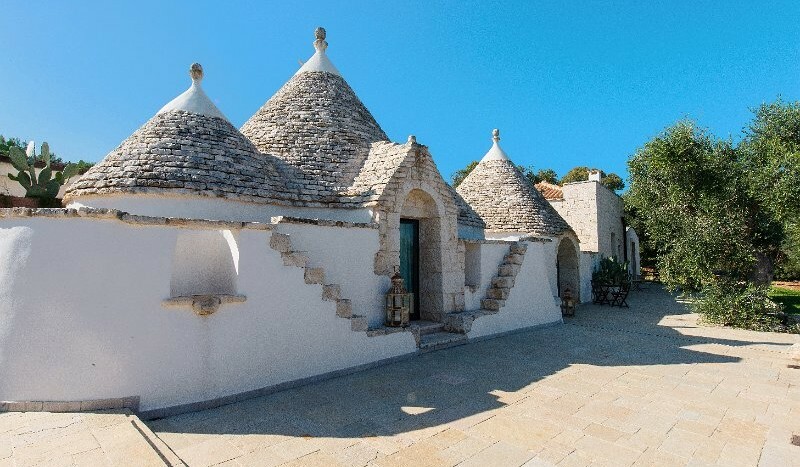 – Doubles cannot be made into twins. 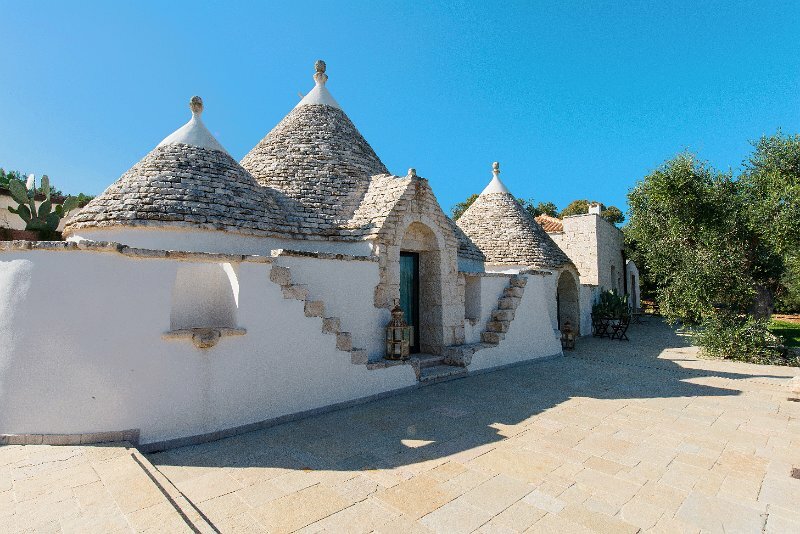 – Twins cannot be made into doubles. 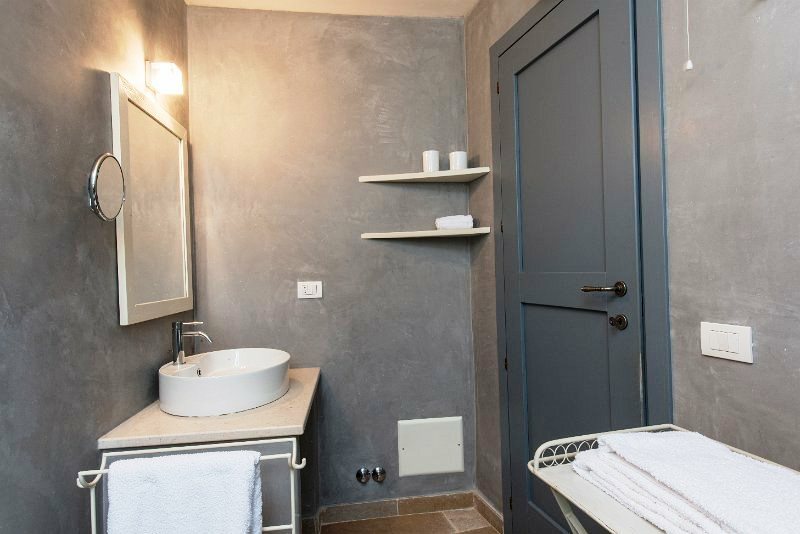 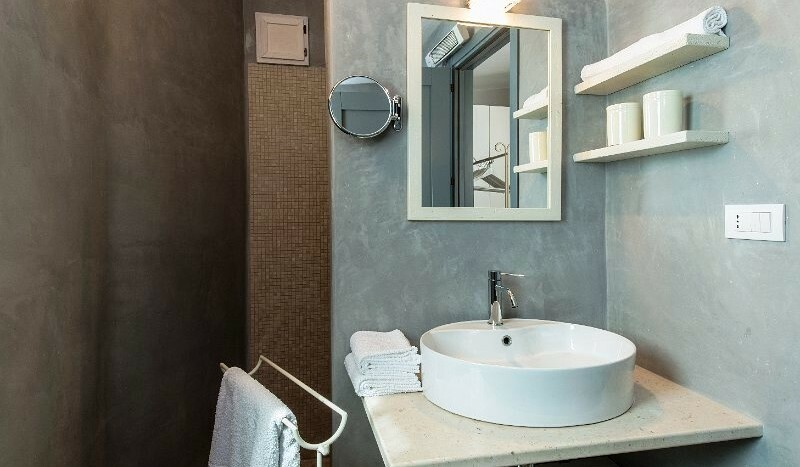 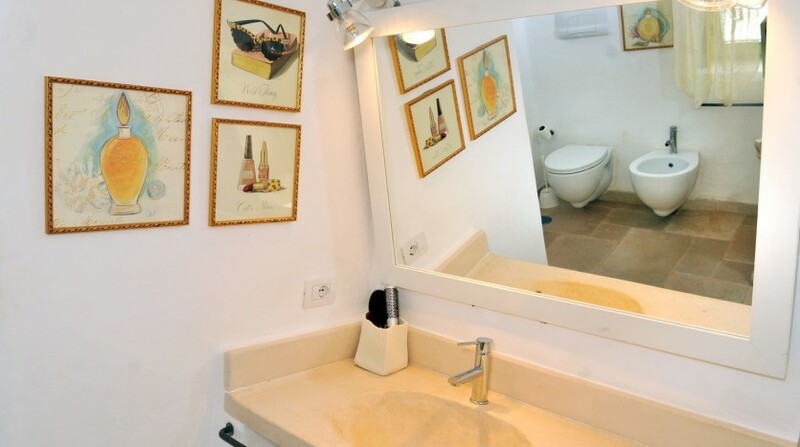 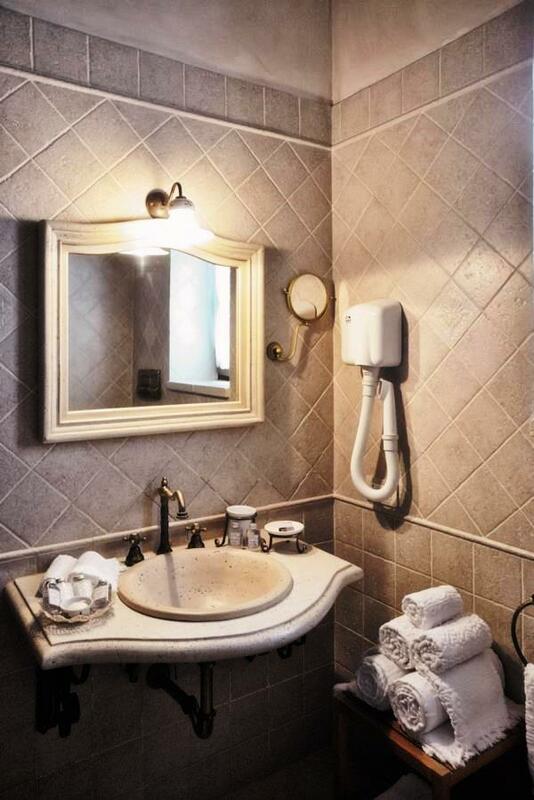 – 1 twin room has an en-suite bathroom. 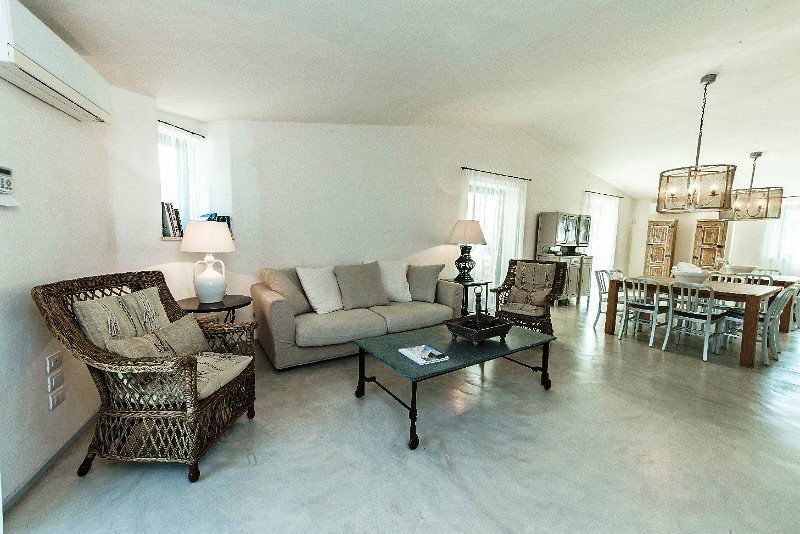 – There is no internal access to the main lounge and dining area. 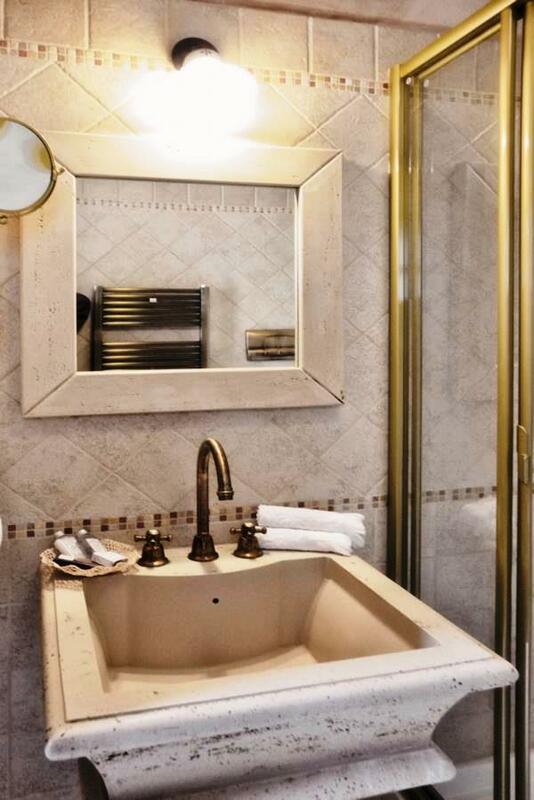 – There is no kitchenette in suite five. 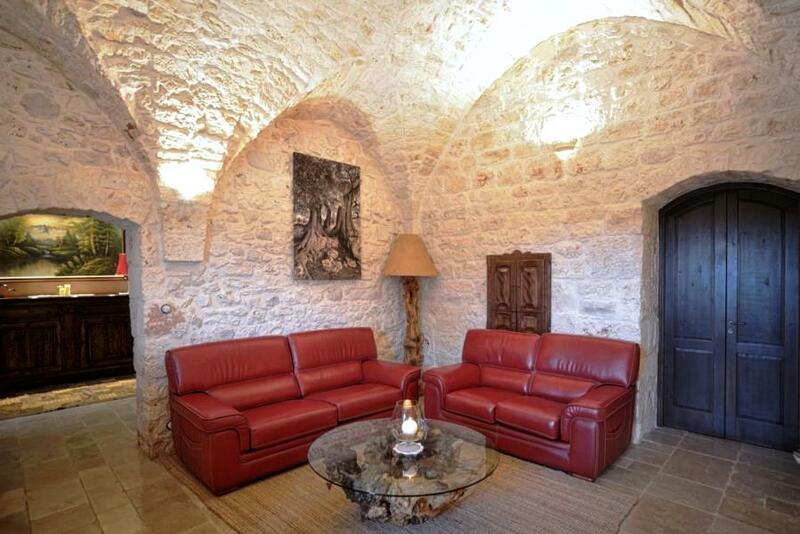 The villa is located 4 km from the Ceglie Messapica town away. 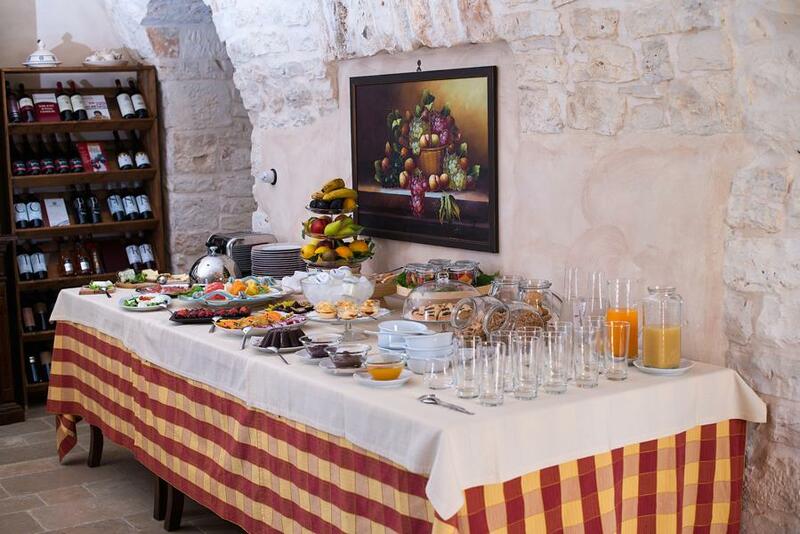 You will find delicious restaurants, banks and shops. 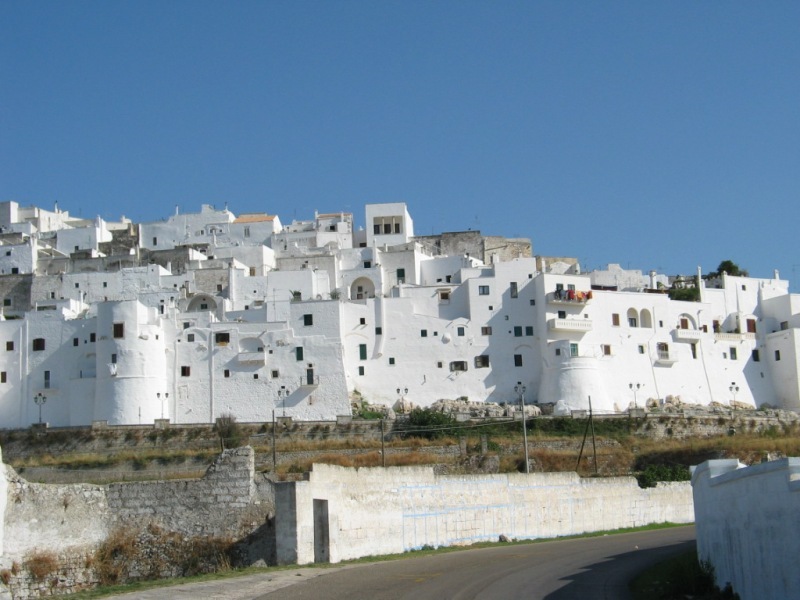 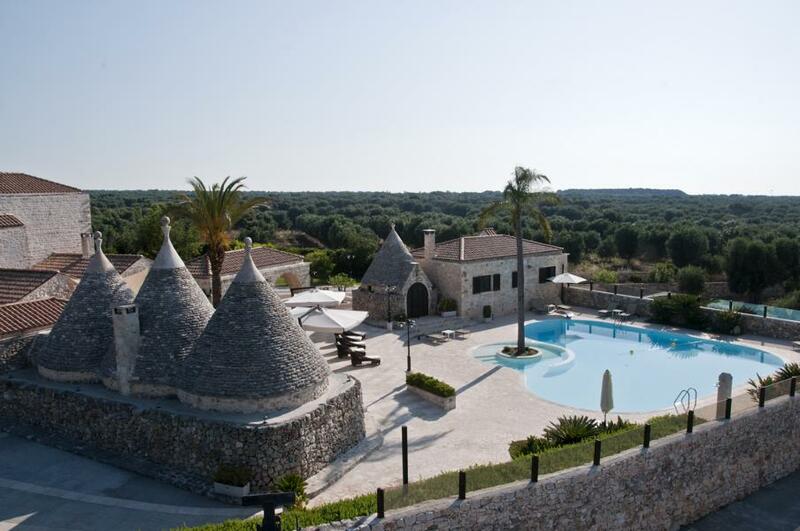 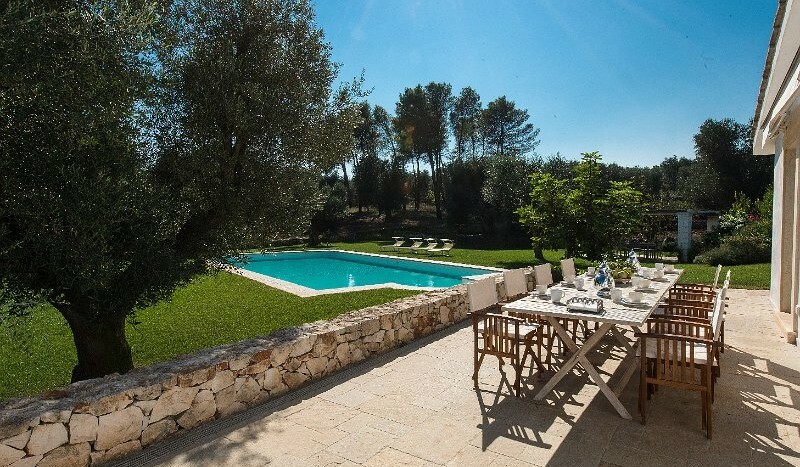 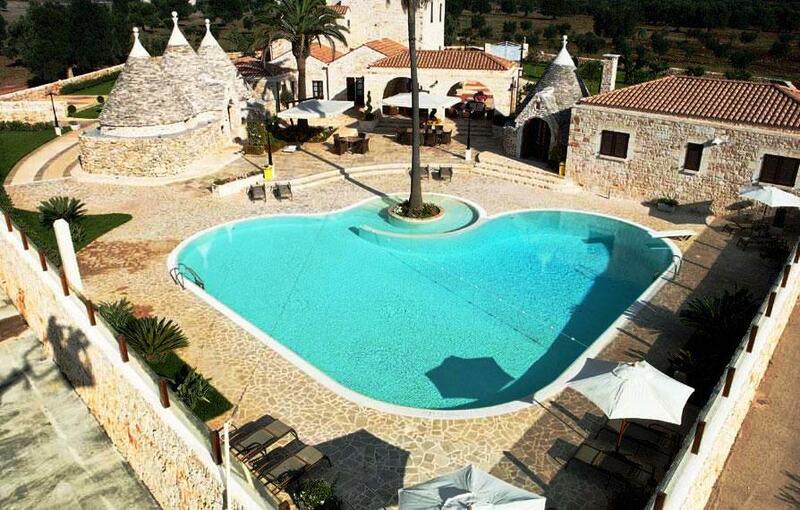 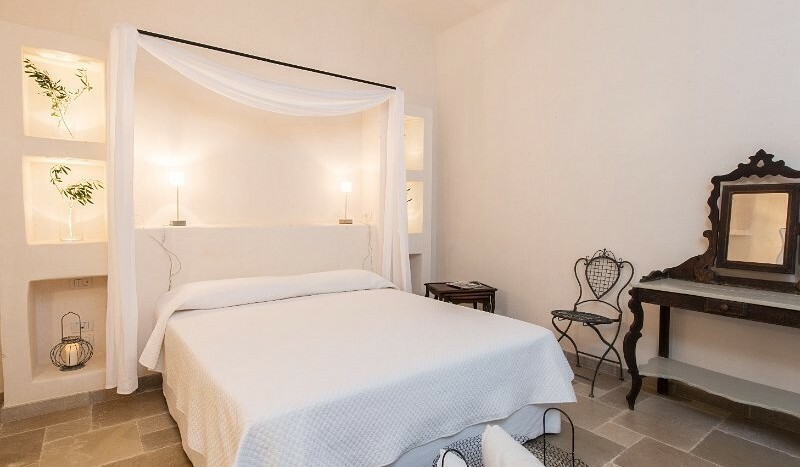 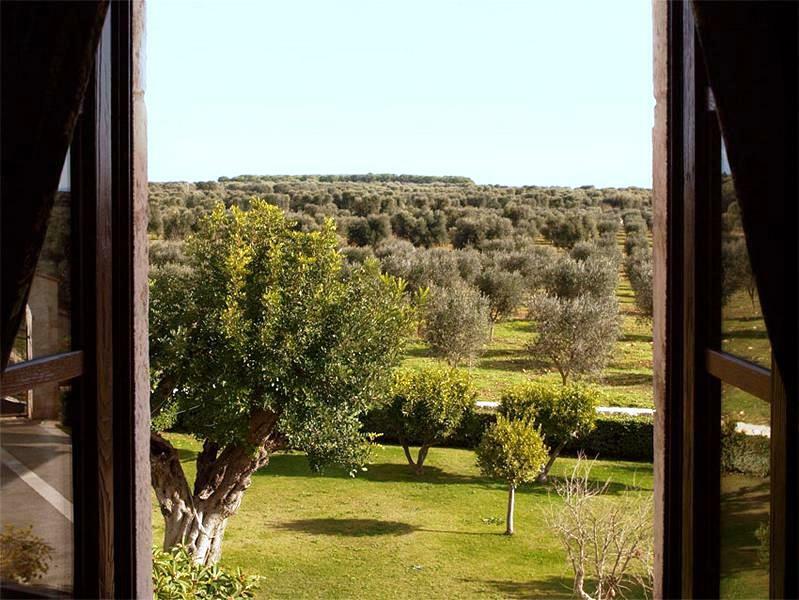 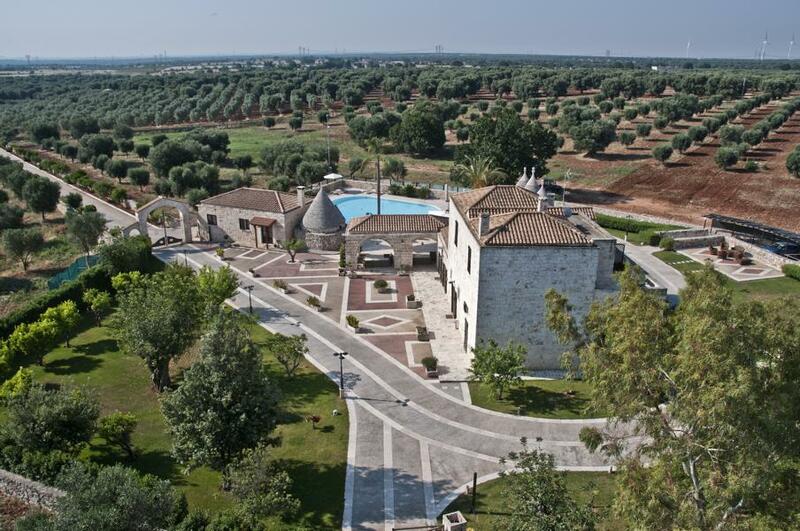 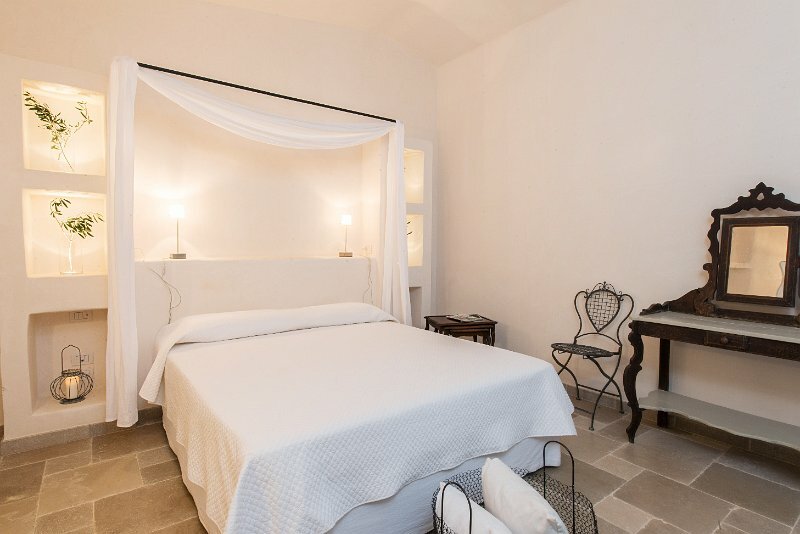 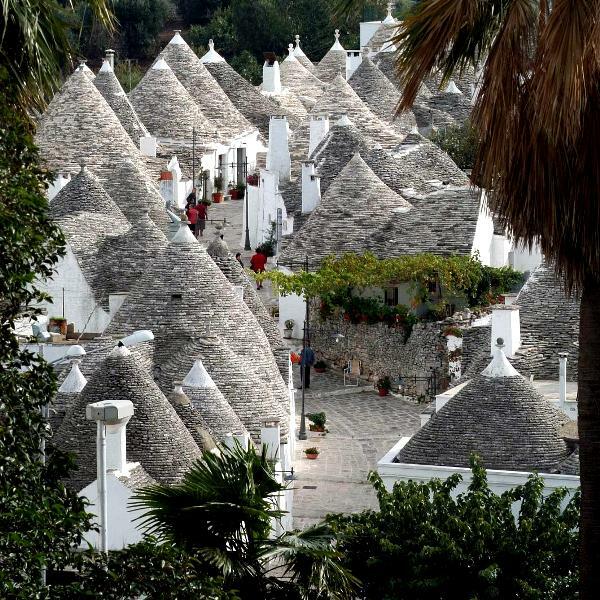 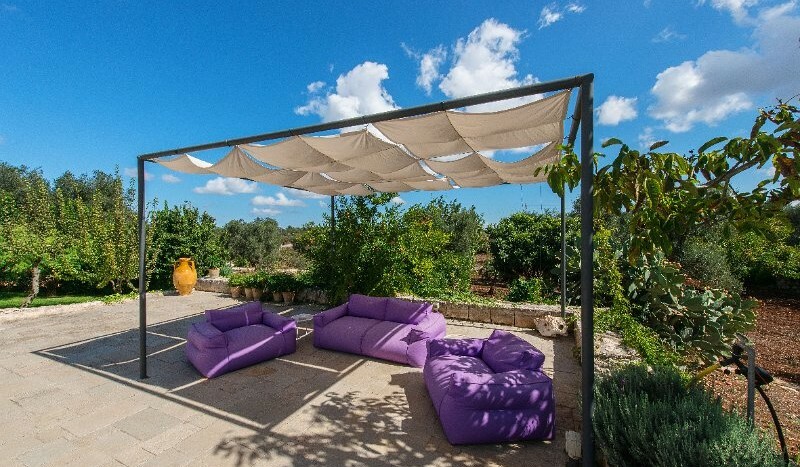 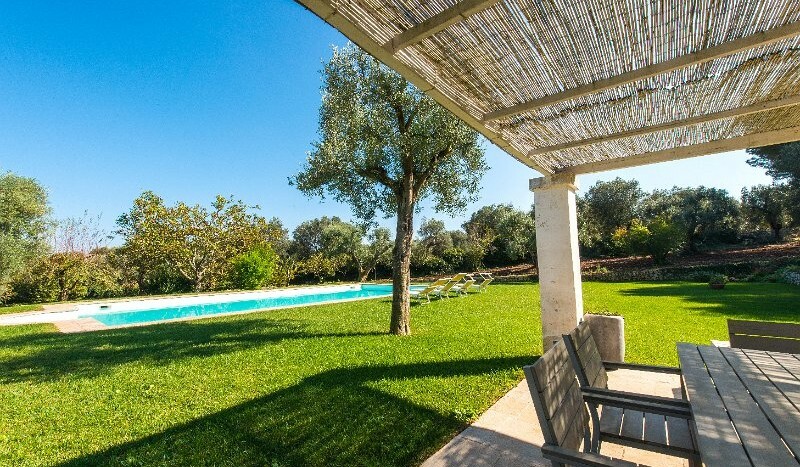 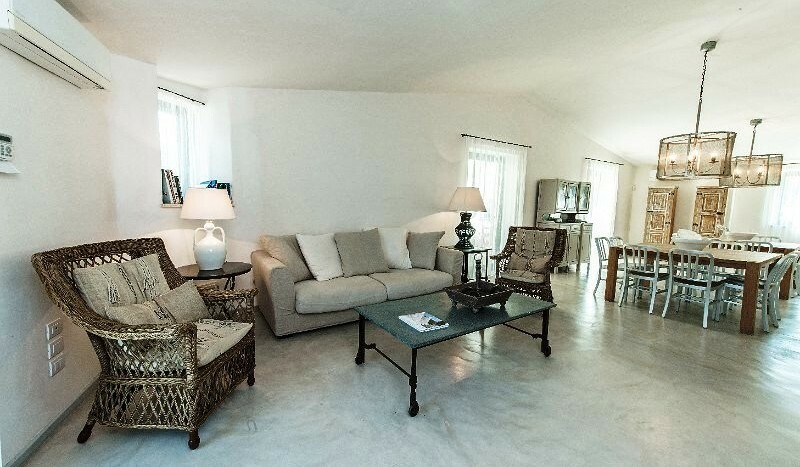 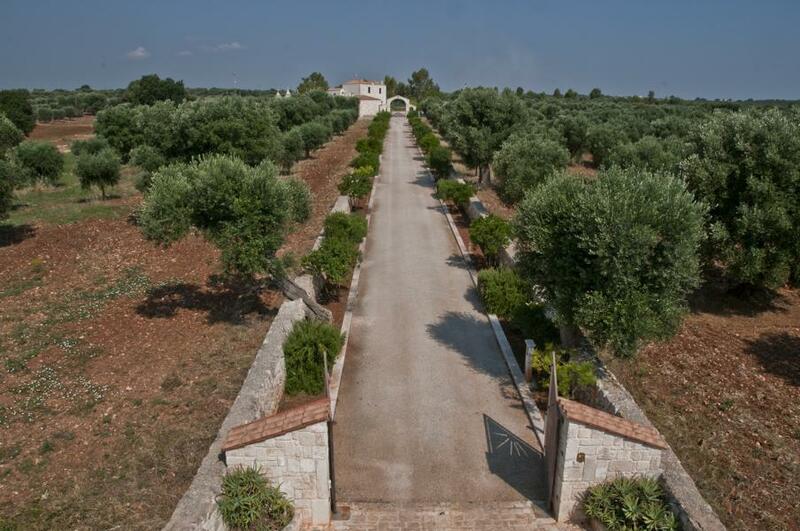 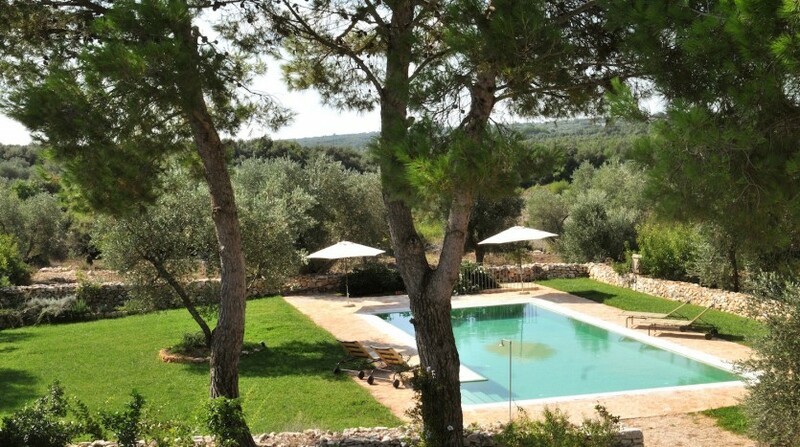 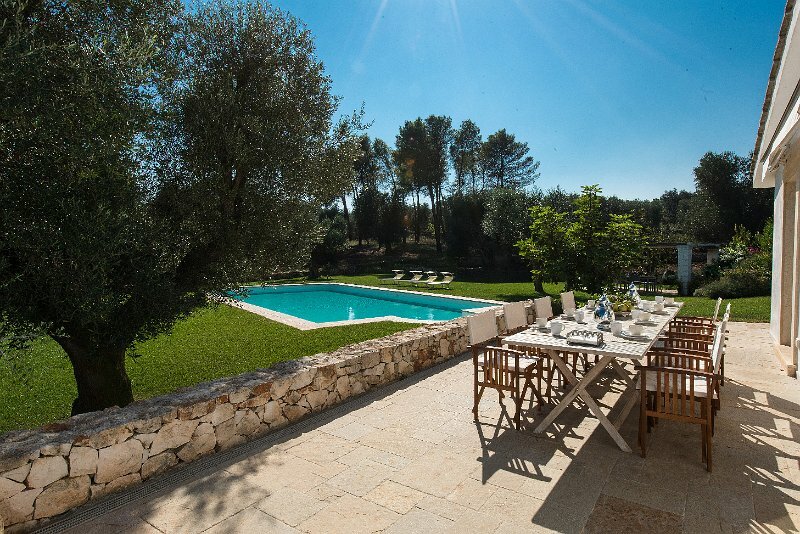 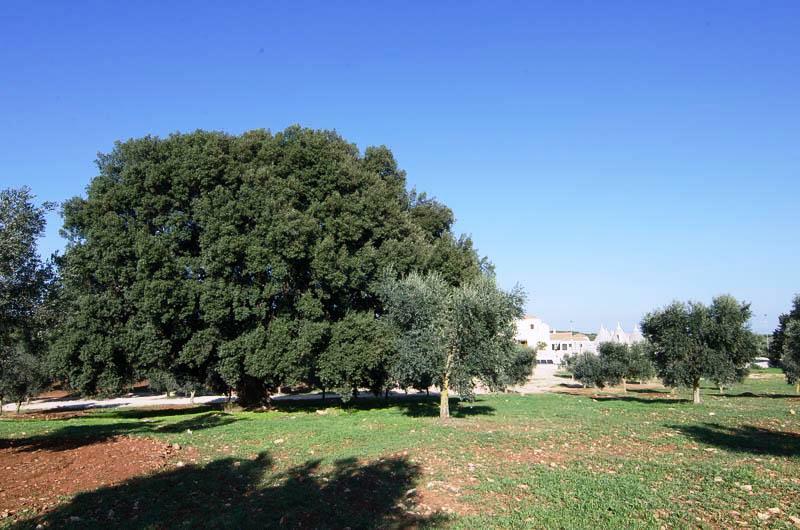 The villa is also 15 km away from the White City of Ostuni. 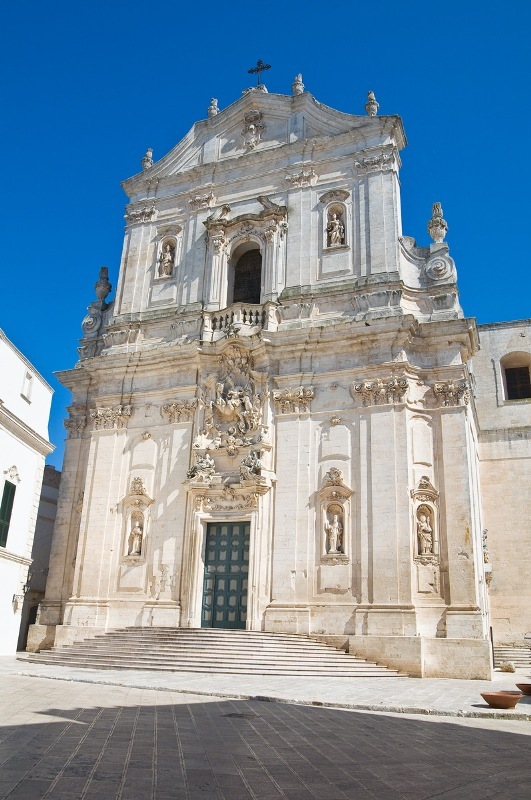 The historic town of Martina Franca, 17 km. 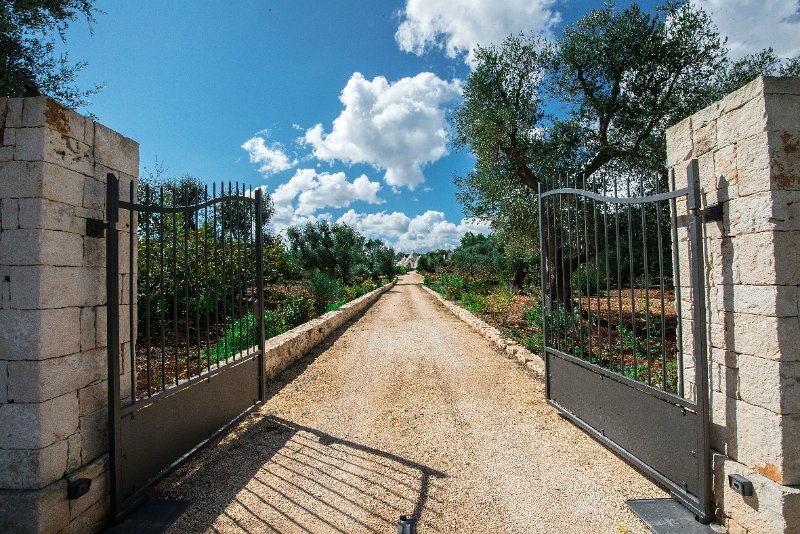 The area to invite you to taste a wine or oil. 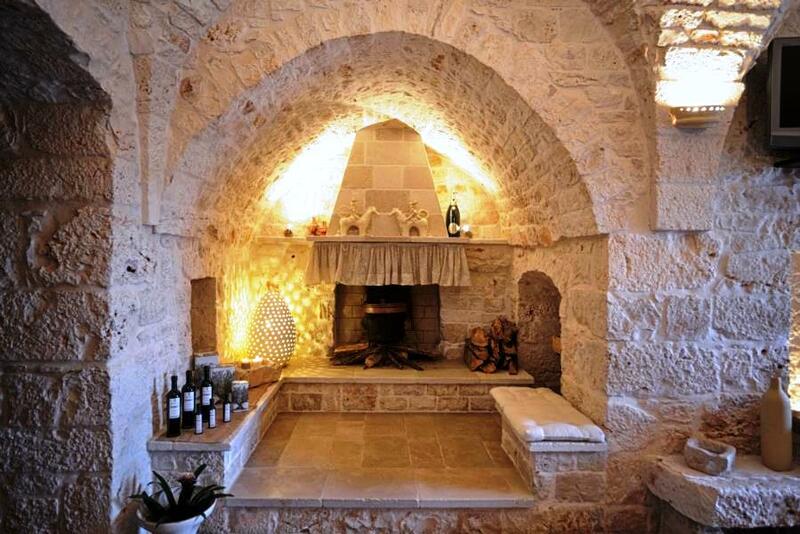 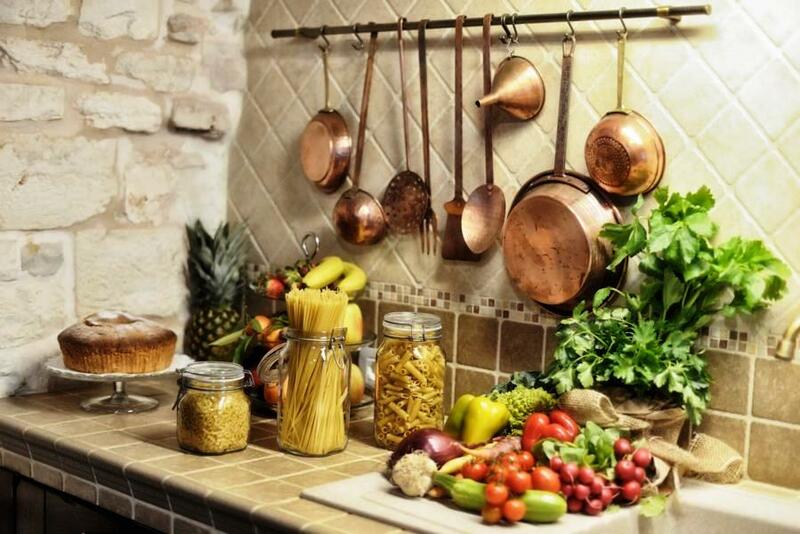 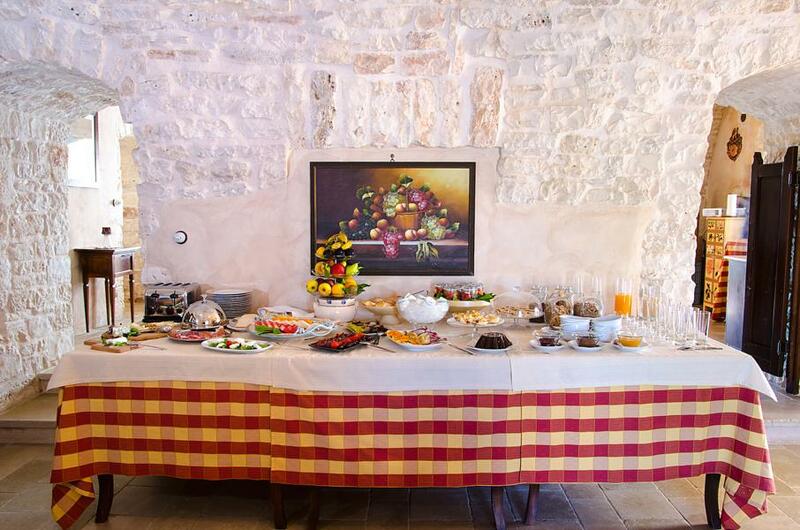 Even sports such as cycling, horseback riding, hiking and cooking classes to know the magic Apulian. 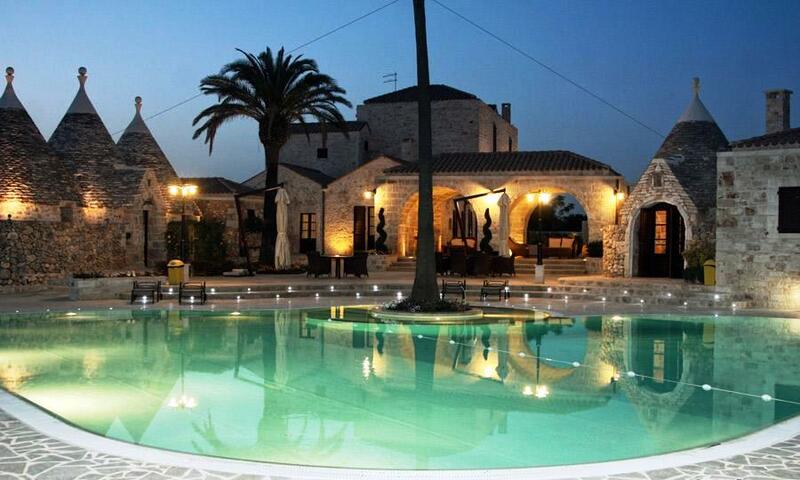 Prices are up to 16 people. 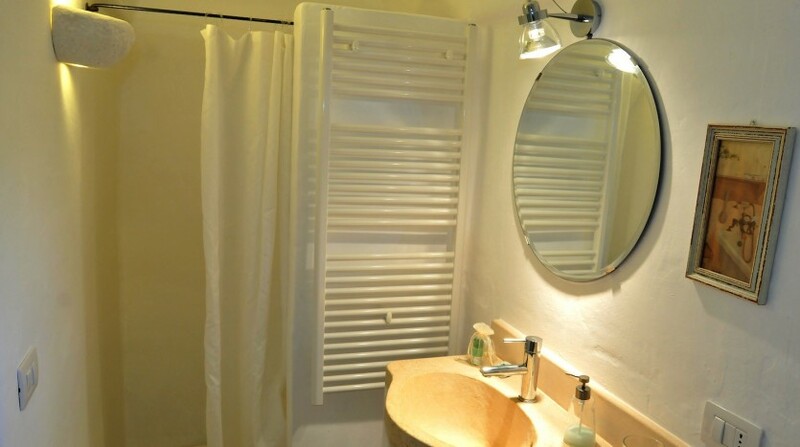 Bed linen and towels (changed weekly), gas, water, electricity (up to € 300, – / week included), final cleaning. 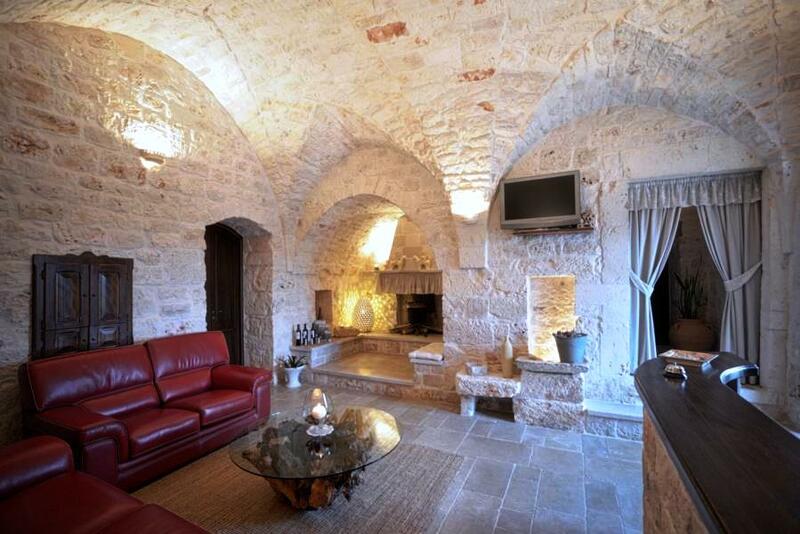 Deposit (in cash to be paid upon arrival): € 1000. 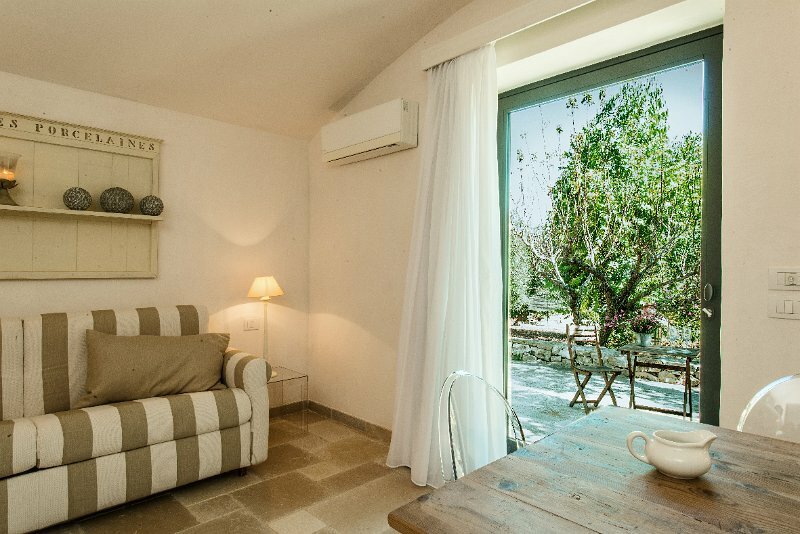 More than 16 people (maximum 18 people) € 100, – / week per person. 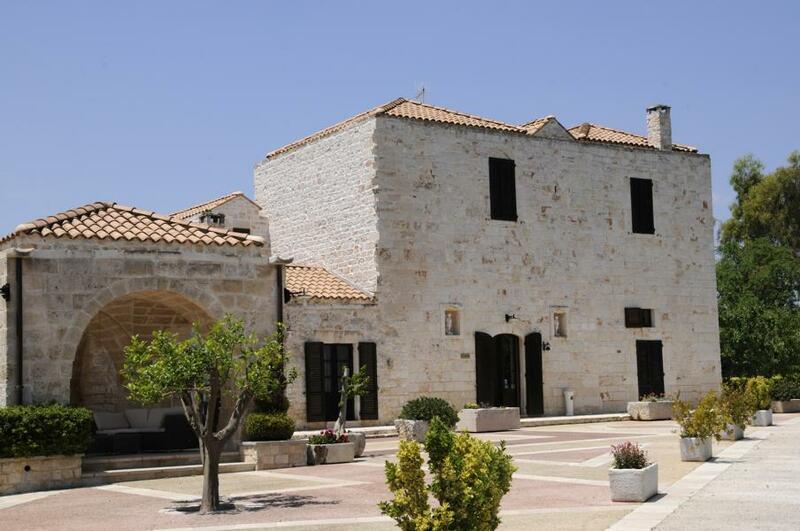 Address: The nearest town is Ceglie Messapica 4km away,where there is a supermarket, bank, pharmacy and other convenience stores. 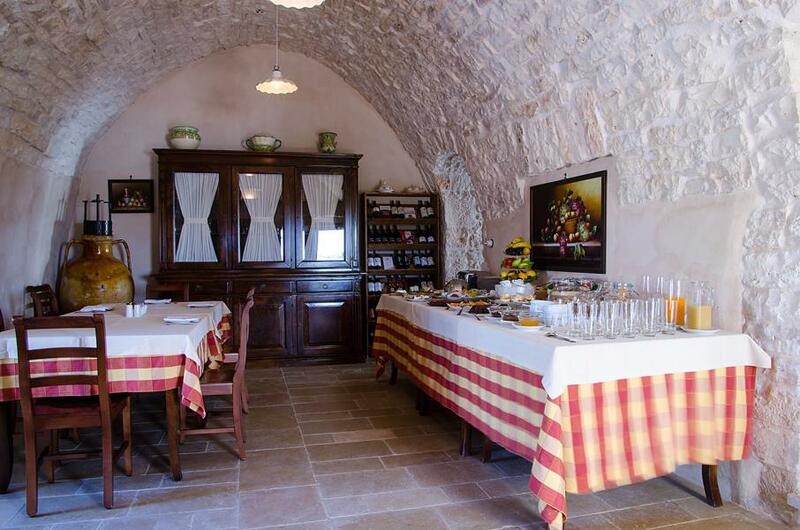 There are several popular restaurants in the local area, Taverna Dei Domenicani, Ristorante al Fornello da Ricci, Casina Terramora and Osteria del Capitolo. 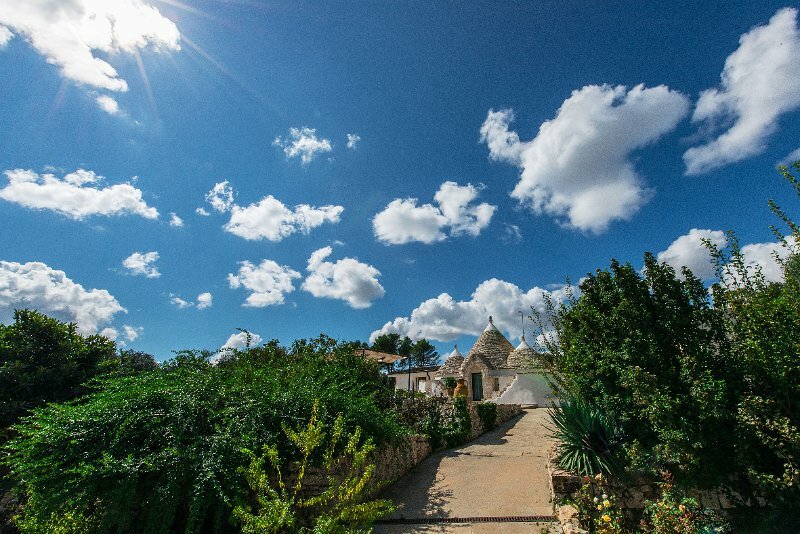 There is a zoo at Fasano 34km away and a water park at Cellino San Marco 57km away. 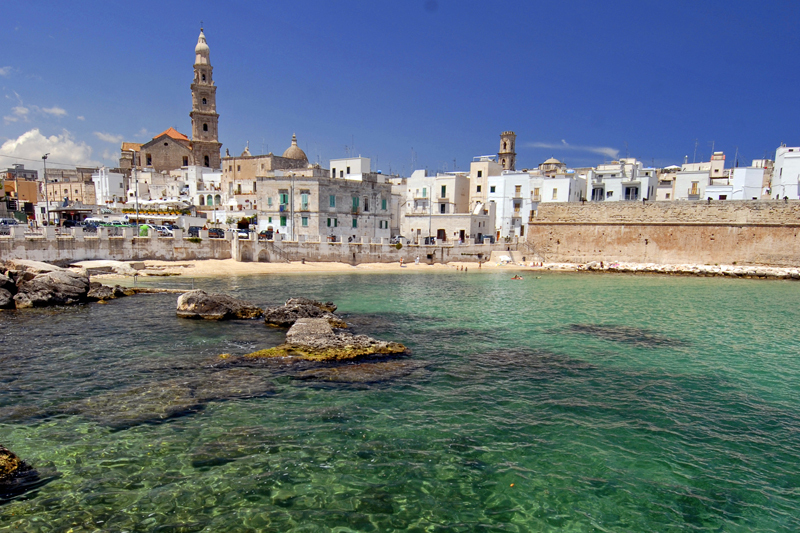 There is also a popular historic beach at Torre Santa Sabina 29km away.